“Our birch plywood comes from sustainable forests in Latvia. Our alloy sheet and trim comes from UK based suppliers and is of aircraft grade. Our ABS is designed especially for our trunks and is a UK made profile for Logicline trunks. Our fittings are supplied by a UK company that has specialised in fittings for 80 years. Our bonding adhesive is purchased from northern UK and uses non toxic ingredients for safe use. Our rivets are supplied by a British firm that specialises in rivet manufacture. Our polyester material is manufactured and supplied by a company based in the northeast of England. with Alloy Trim. Made in England by LogicLine Trunks Ltd. The H.J. Cave & Sons (founded in 1839) ‘Osilite’ case, is a strong and light trunk that was used on the 1933 Everest Expedition. The trunk was popular as an early flight case. It is still made today in the UK. They also make handbags. The company produces a small number of exclusive bespoke lines in small production runs. 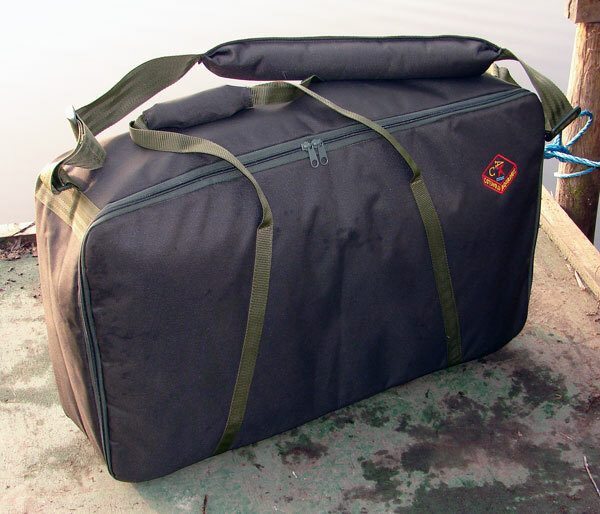 Topper Cases manufacture flight cases, ABS cases, pilot cases and soft bags in England, off-the-shelf or bespoke, in any quantity. Prices are not shown on their website, so you will have to contact them to ask. They also sell foreign made brands. 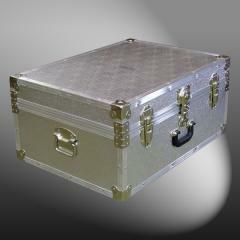 Flightcase UK make custom flight cases, custom made cases and protective cases in the UK. Montrose Messenger Bag in navy. Made in Scotland. 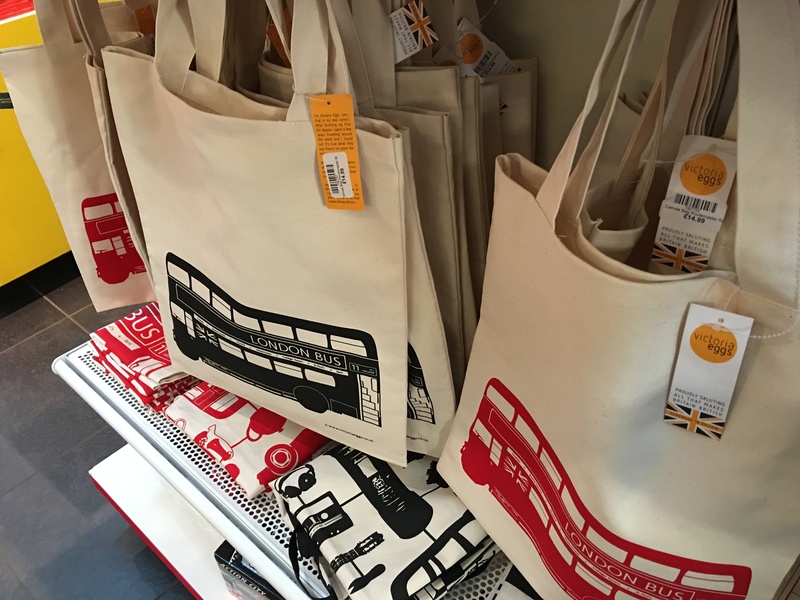 London Bus tote bags by Victoria Eggs in the London Transport Museum Shop. Handmade in Britain. Photograph by author. Ohyo collapsable water bottles are made in England. Disappointingly the Ohyo Bag is now foreign made. On the Ohyo website the Ohyo Bottle rightly proudly states it is made in England. From their kickstarter campaign I know Ohyo’s original intention with the Ohyo Bag was that it would be made in London by Jas Sehmbi in his London workshop, where the prototypes were made. It was great that it was being manufactured in London by Jas Sehmbi at Jas MB Ltd. However I now understand from their second kickstarter campaign manufacturing now takes place overseas. As I say, disappointing. 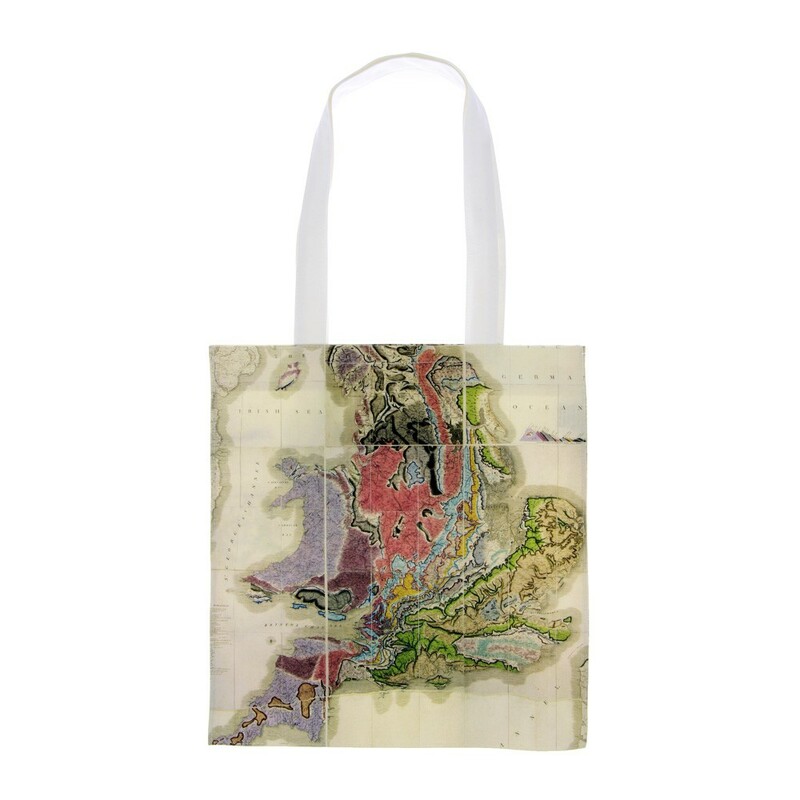 Natural History Museum William Smith geological map tote bag. Made in the UK. 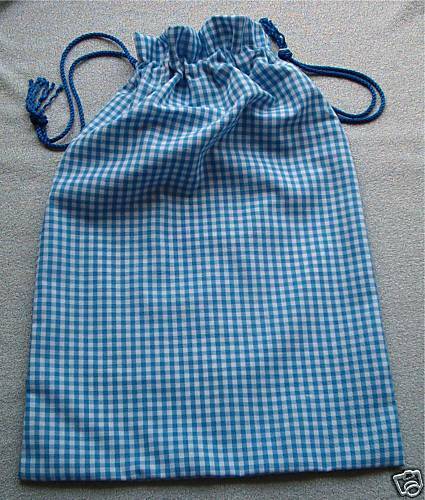 Bags-n-Aprons DUVET/QUILT STORAGE BAG, KING SIZE. Manufactured in the UK from strong Calico fabric. DRAW STRING BAG HAND MADE IN UK BY LINDON TEXTILES. Made in England logo on a Grafea mini bucket bag. 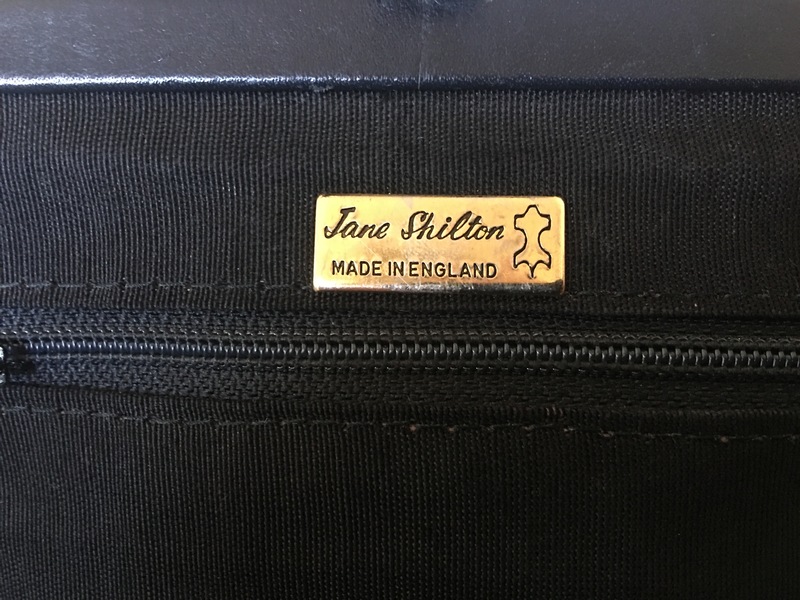 Jane Shilton handbags, like the one in the picture below, used to be made in England. Sadly Jane Shilton products are now all foreign made. Jane Shilton handbags, like the one in this picture, used to be made in England. Sadly Jane Shilton products are now all foreign made. Make it British list their top 50 British made bags – the focus of this article from July 2017 is on some great British made handbags and it lists some bags I have not had the chance to feature on my site yet. Marlborough World Military Wet Pack in black leather. Made in England. Pittards has production facilities (a tannery) in the UK in Yeovil, England and also abroad. They now do finished products as well continuing leather production. Their England Collection is made in the UK by Pittards. Daines and Hatherway products are made in England. Many, but not all, other finished leather products from Pittards are foreign made. Made in England items are clearly labeled as such. Country of origin is not given for foreign made products. 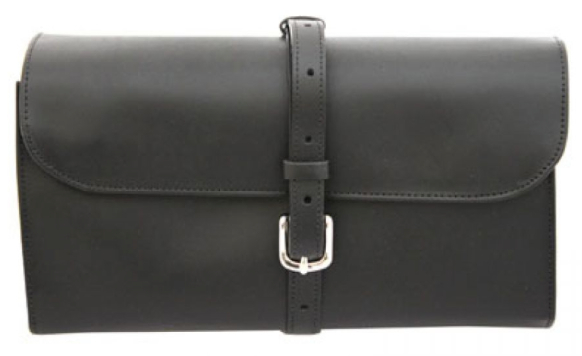 Examples of UK made leather products by Petards include the Daines and Hathaway range (luggage tags, technology cases, hip flasks, passport covers, purses, wallets, pouches, notebook covers, folding travel tidy trays, tidy trays, stud boxes, cufflink boxes, watch rolls, watch boxes, jewellery boxes, wash bags, leather messenger bags, document cases, and holdalls), plus shopper bags, satchels, rucksacks, leather t-shirts, leather skirts, leather jackets, leather shoulder bags, clutch bags, and leather tote bags. They have manufacturing facilities (a tannery) Ethiopia where they also source much of their raw material (sheep leather) and they make finished products elsewhere in Ethiopia in Addis Ababa city. Other production is outsourced to factories in Asia. Some leather production remains in Somerset and they make leathers for other manufacturers to use, working with makers small and large. For example they supply the leather used in New Balance UK made trainer collection. They also also the owners of Daines and Hatherway leather goods and travel accessory makers in Walsall, England who they rescued from bankruptcy in 2008. Daines and Hathaway were originally founded in 1922. Pittards can trace its origin back to 1826. The company are currently trying to reacquire the freehold to the somerset factory which they had previously sold and leased back. 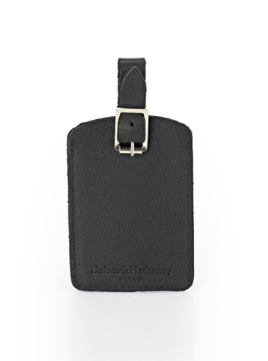 Daines and Hatherway leather luggage tag (single) – krypton. Made in England. 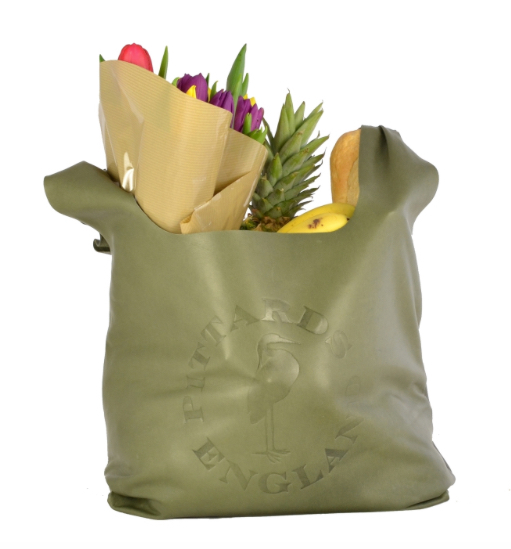 Pittards shopper bag dark green. Made in England. 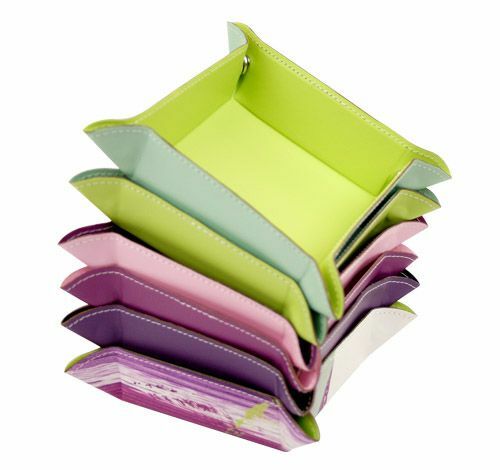 Undercover Recycled Leather Square Tray Tidy. Made in England. 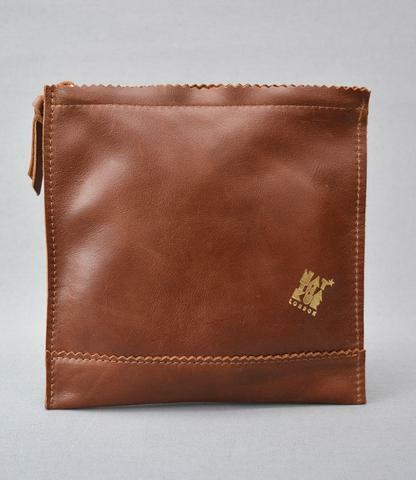 Natthakur LEATHER SWEETSHOP CLUTCH BAG IN BROWN. Made in England. 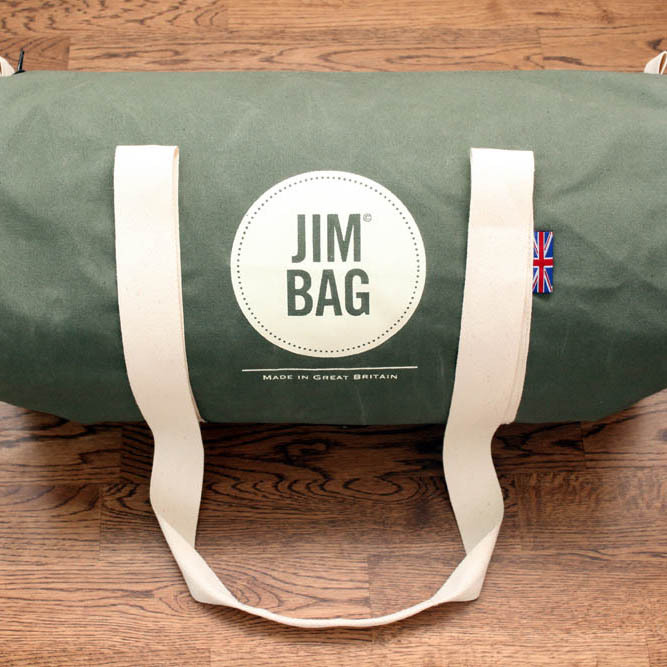 Jim Bag olive barrel bag. Made in Great Britain. 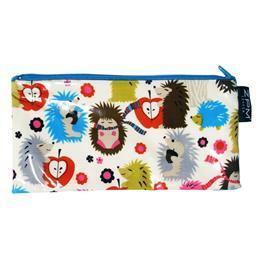 Anorak kissing hedgehogs pencil case or pouch. Made in Britain. Photograph by author 2 July 2017. 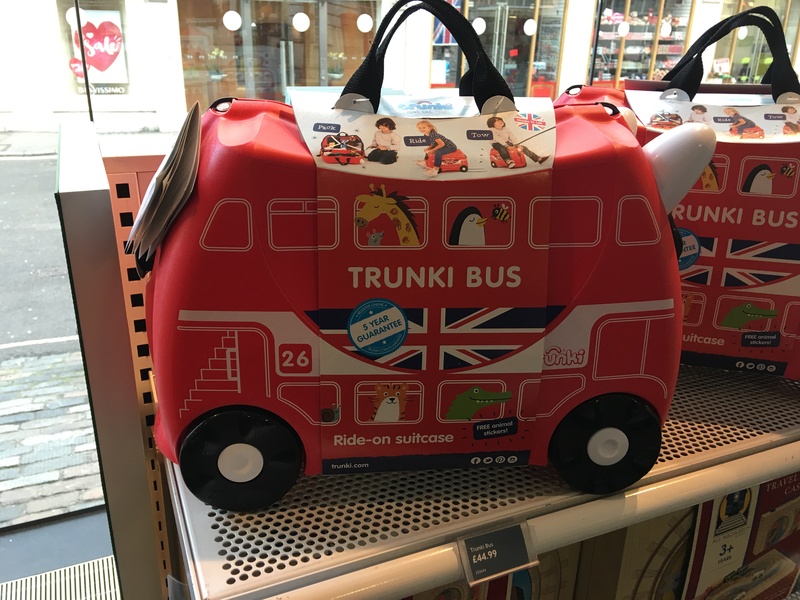 Trunki Bus ride-on suitcase. Made in UK. On sale at the London Transport Museum shop 20th January 2016. Photograph by author. Whilst a lot of stuff in the London Transport Museum Shop is made in China, they do stock a very good range of UK made products too. Foster and Son make their exclusive luggage, suitcases, attache cases, briefcases, backgammon boards, portfolios and other bags in London, off-the-shelf or bespoke. Susie Faulks oilcloth ladies bags, made in England and totally free from animal products & PeTA approved. 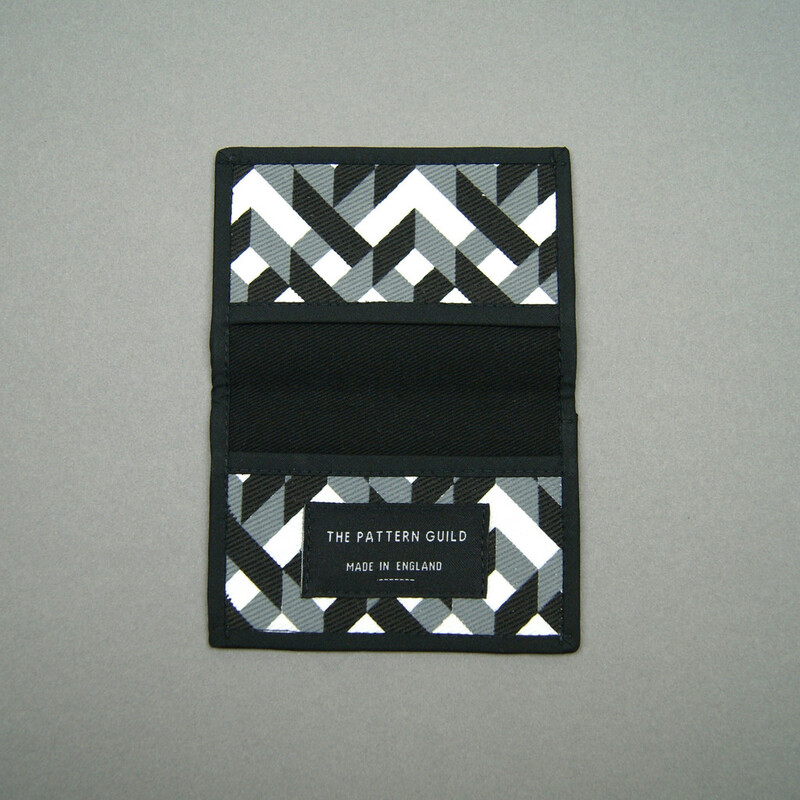 The Pattern Guild chains pattern card holder 10cm W x 7cm H. Made in England. Sourced Truck Tarp Messenger (S). Made in England. 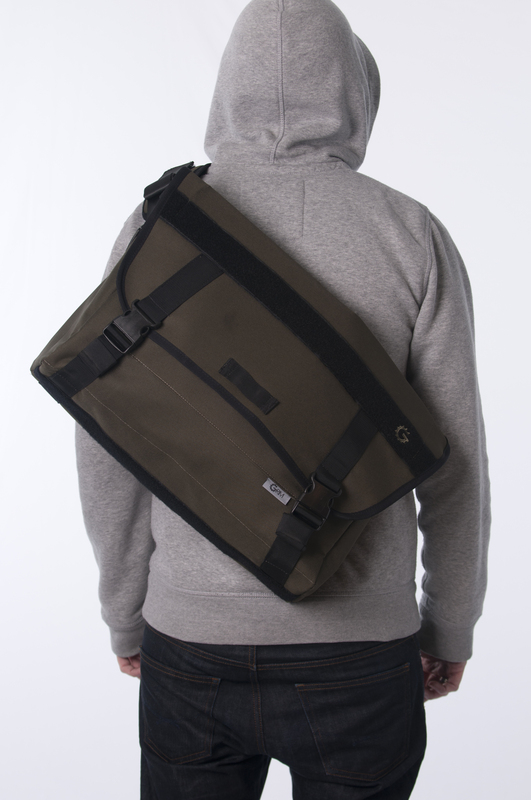 GRIM Burton Messenger Bag (OLIVE GREEN). Made in the UK. Kaboodle Bags. Made in the UK. Sea Salt Cornwall have a small range of made in the UK kit bags and shopping bags. 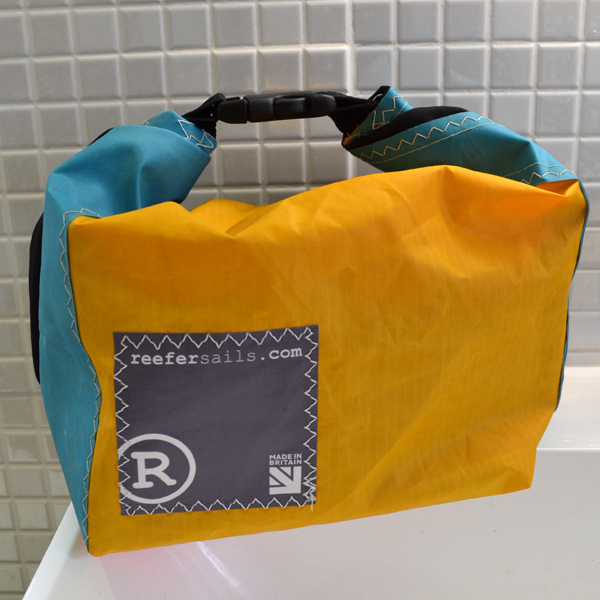 Reefer roll-top washbag, made from windsurf sailcloth, orange, purple, green. Made in Britain. 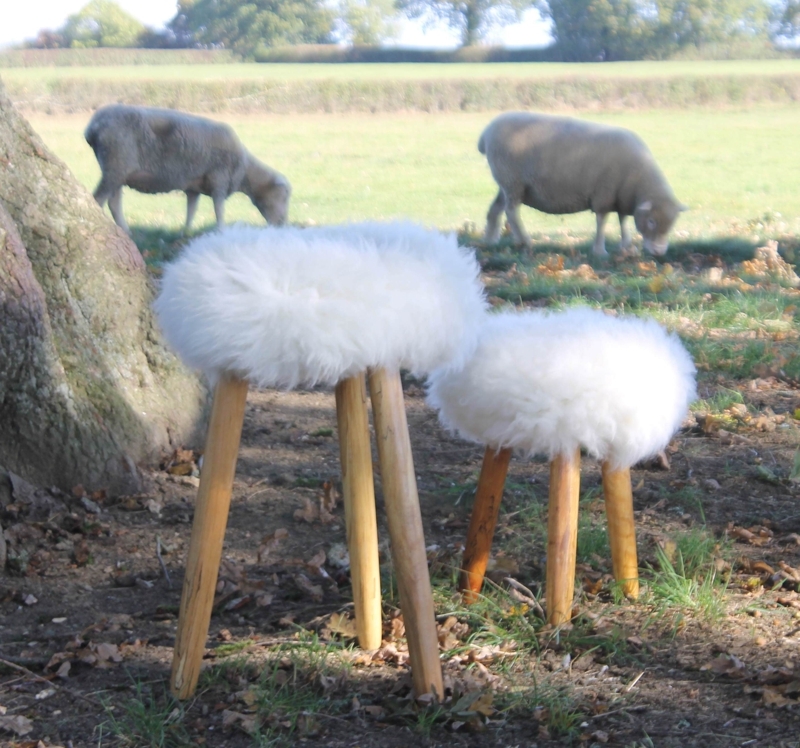 English Cowhide Company Three Legged Sheepskin Milking Stool. Totally made in England. Padded Protection Bags , Leather Holsters, Equipment bags. 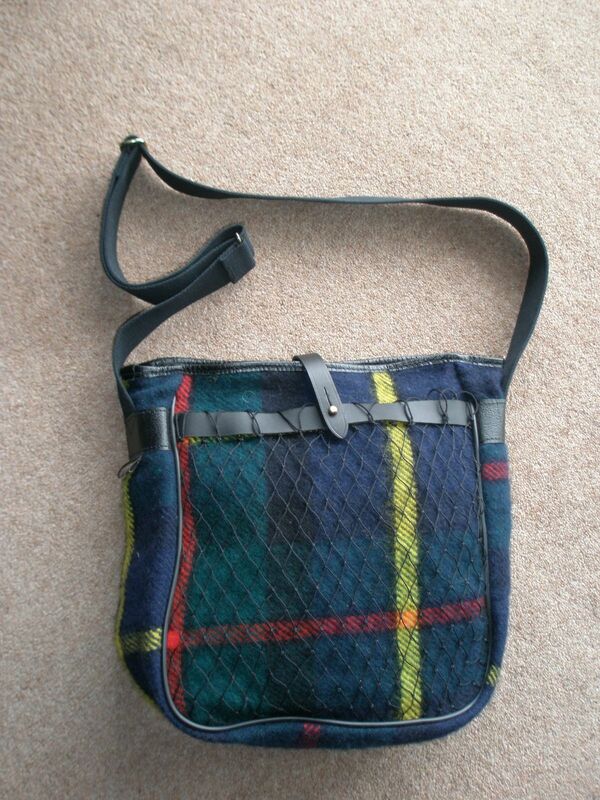 Quality Gunslips tartan wool and leather shoulder bag. Made in the UK. 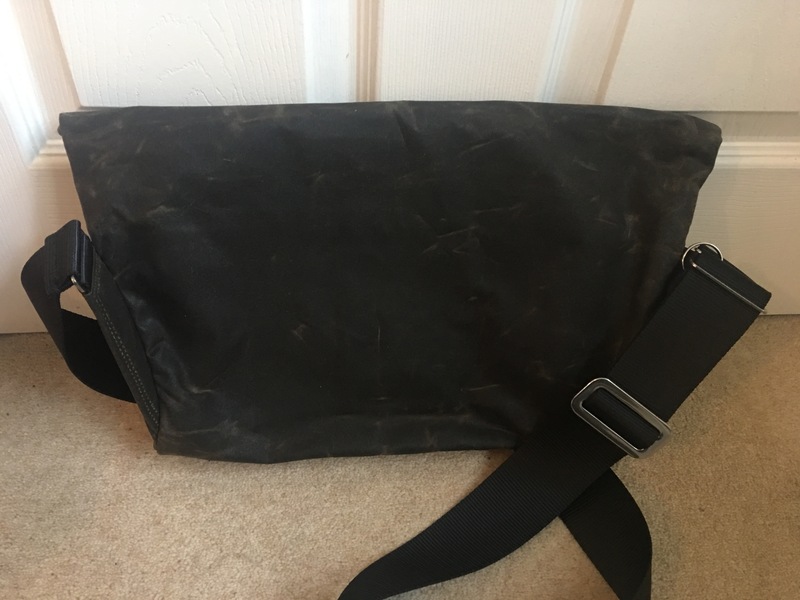 Quality Gunslips messenger bag Made in Mid Wales label. Photograph by author. Bags4Everything (Gardner of Wakefield) bags are all made in their factory in Ossett, West Yorkshire, England – http://www.bags4everything.co.uk This is how Bags4Everything describe their product range: “We have more than 100 products in our range which include 40 litre aqua roll bags, 50 litre water hog bags, waste master bags, waste hog bags, LCD TV bags, tow hitch covers, wheel covers, pole bags, awning bags, insulated aqua roll covers and garden furniture covers to name but a few. We can make bags and covers made to measure please contact us for a free quote. We can cater for individuals or companies from 1 item to 100s of items! 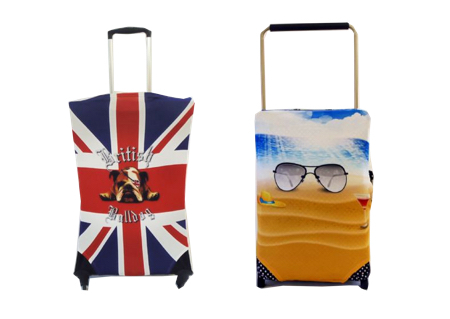 ” Just the place to find British made bags and covers for practically anything, but note the non-bag products they sell are foreign made. Croots England make sporting shoulder bags, rucksacks, technology cases and luggage (holdalls) in canvas and leather. All Made in England. 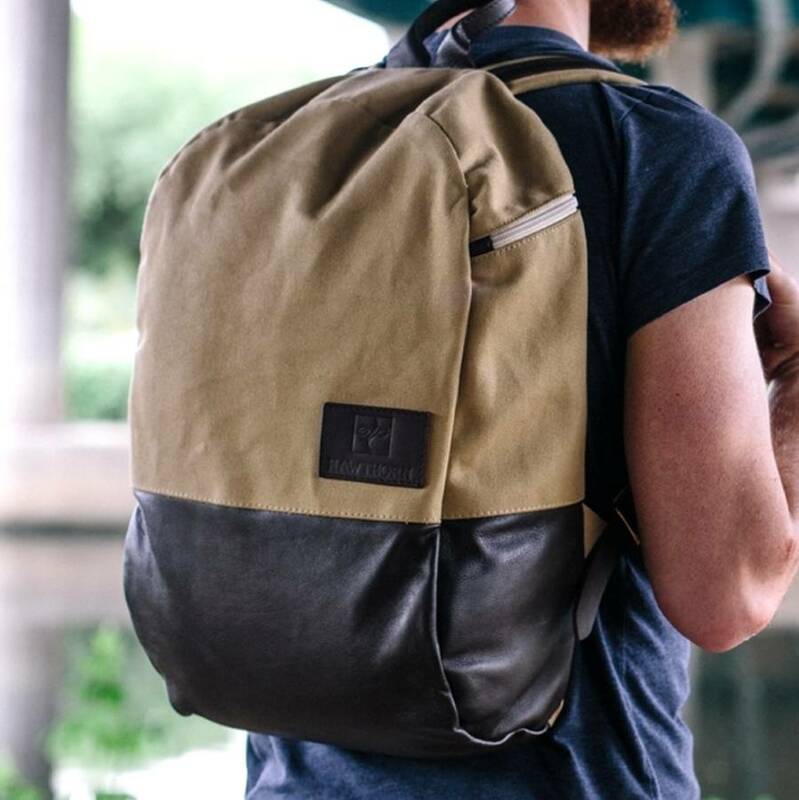 Bill Amberg leather goods are made in England and Spain, for example they sell English made canvas bags, a leather rucksack, a cartridge case and pouch, messenger bags and so on, but remember many of their products are foreign made. Mulberry still have a factory in Somerset but it is hard to tell from their website what is made in the UK. Mulberry make exclusive suitcases, holdalls and leather travel accessories but you will have to ask their head office whether the item you want is made in the UK or look for a made in the UK label. They also make mens bags, handbags, accessories, and womenswear. Mulberry have confirmed to me that their suitcases and luggage are made overseas and not in the UK. This link – http://www.mulberry.com/investor-relations/profile/#CSR – explains how Mulberry manufacture in the UK and abroad. 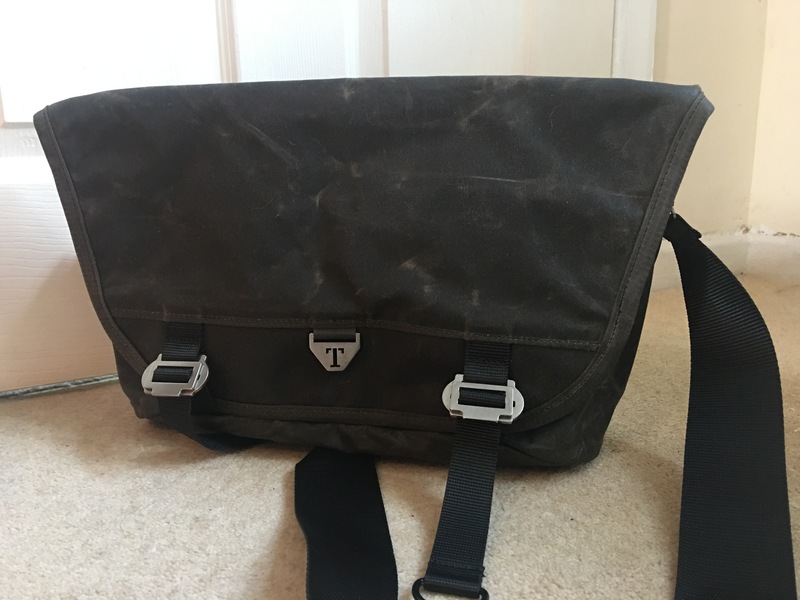 Made in the United Kingdom, Billingham bags are primarily exclusive camera bags, but might be of interest. 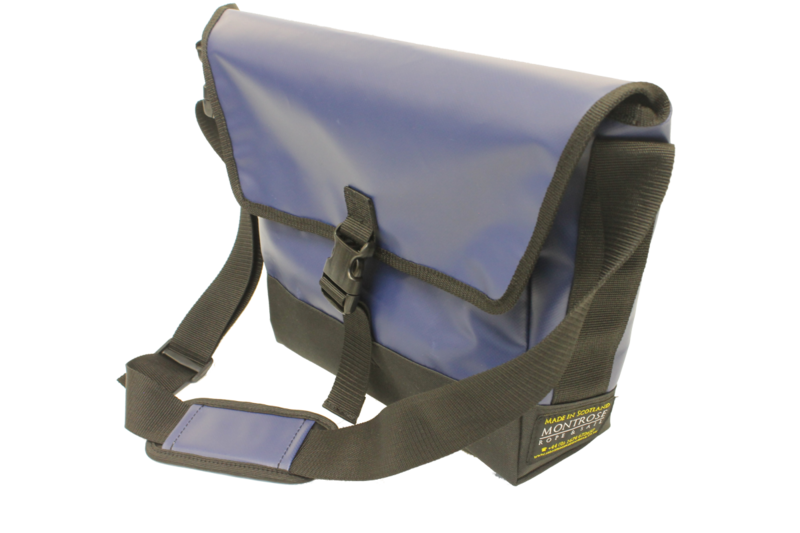 Camera Care Systems camera bags – I am told that “Most of the CCS cases we have remaining in stock are UK made, the only case made outside the UK is the Freestyle one.” RK Photographic, bought the remaining stock when the owner retired and these cases are no longer being manufactured. 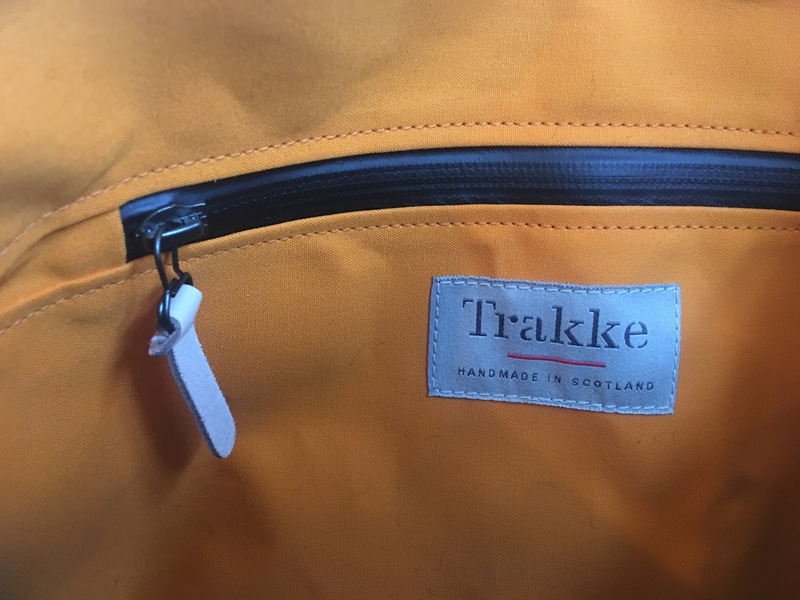 Also, some Carradice bicycle bags may still be made in Nelson, England; possibly the cotton duck bags (Super C range and Originals) and perhaps the rainwear and the drywool jerseys, but you will have to ask them as it is not clear from their website. Dunmore Scotland sell a range of UK made bags retail and wholesale, including shopping bags, holdalls, messenger bags and so on. 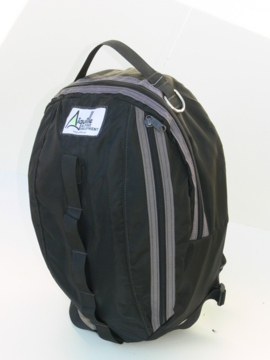 Sidewinder Apparel – rucksacks (and belts) made in the UK – http://www.sidewinderapparel.co.uk. Also available at http://www.madeintheseisles.co.uk/sidewinder-apparel. 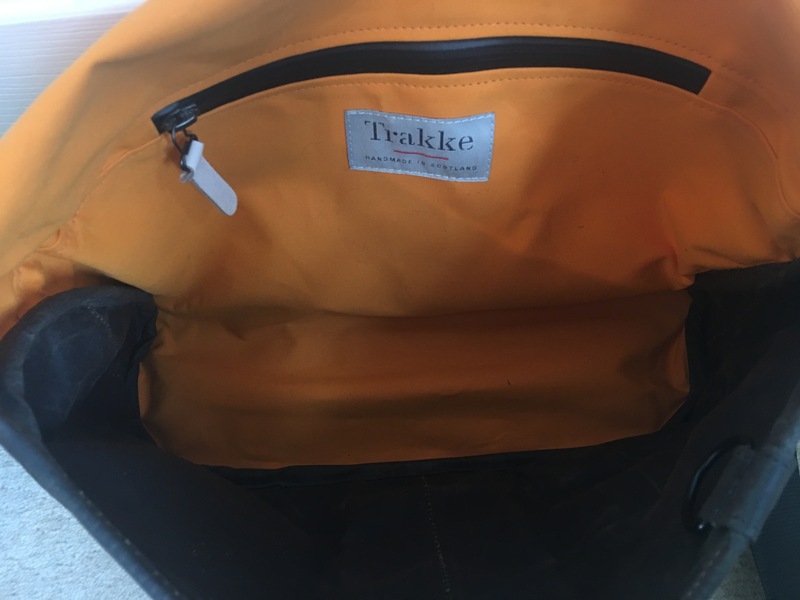 Brooks make one or two cycling rucksacks in the UK, e.g. the Eton leather satchel and the Piccadilly leather knapsack. Most of their accessories are foreign made. Most of their bicycle saddles are still made in England. Bradley’s is a small independent leather tannery in Shropshire, England – http://www.bradleysthetannery.co.uk – I think most or possibly all of their products are made in the UK – travel bags, rucksacks, messenger bags, shoulder bags, leather satchels, and wallets, as well leather aprons, leather gardening gloves, leather kneeling pads and so on. Bond and Knight MK2 Original wallet. Made in England. The Muddy Dog Company make their handbags in Britain. They also make an overnight bag. No indication of price on their website. http://www.muddydogs.com / http://www.themuddydogcompany.com. Aiguille Alpine rucksacks are all made in England. 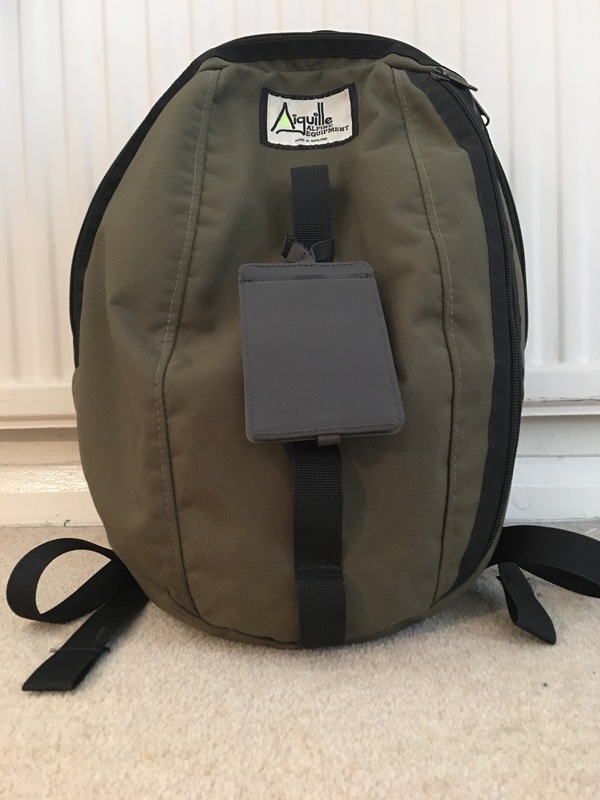 Aiguille Alpine do a wide range in their widely renowned quality rucksacks (backpacks) and many other useful bags including rope bags, travel bags, holdalls, shoulder bags, zipped pouches, bumbags, camera cases, belt pouches and so on. Highly recommended. 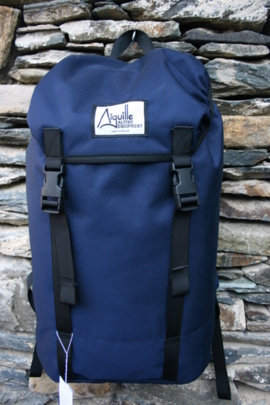 For rucksacks, chalk bags, rope bags, holdalls, travel bags, beanie hats and much more try Aiguille Alpine. Based near Kendal, their own brand stuff in made in their own workshop. 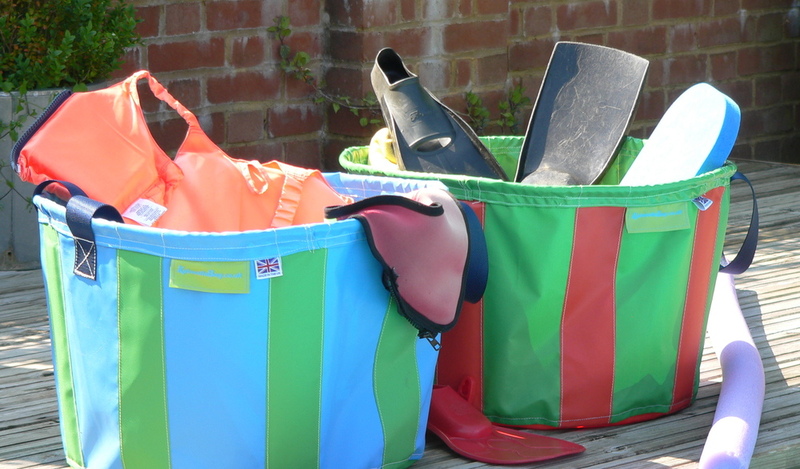 They specialise in climbing, outdoor, canoeing and kayaking equipment and much of what they sell is UK made. 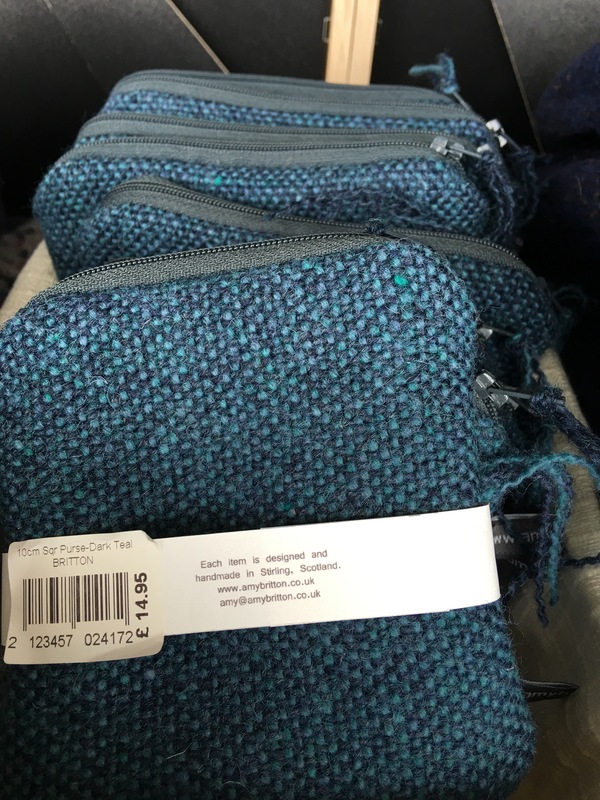 Their website states “All of Aiguille Alpines products are hand made in the United Kingdom” but not everything they sell is UK made, so please do check before buying. Their shop in Staveley, Cumbria, just off the A591 (the main route into the Lakes) is only 4 miles from Windermere, has free parking, and is open Monday-Saturday. Established in 1987. Aiguille Alpine Midi Rucksack. Made in England. Aiguille Alpine Runout Rucksack. Made in England. Capacity: 20 Litres. Weight 0.55kg; Grab handle; Metal ‘D’ loops; Three point hauling system; Large capacity external pocket. 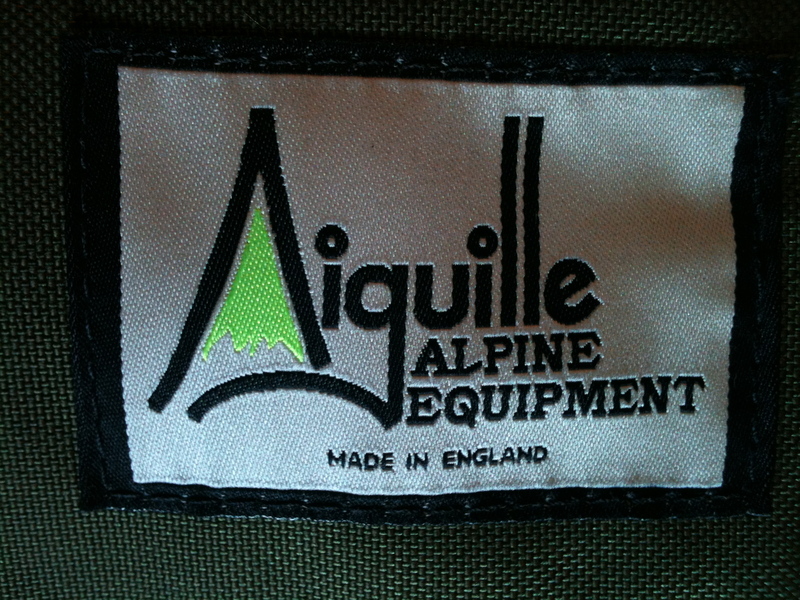 Aiguille Alpine Equipment Made in England Label (on a Runout Rucksack), 31.8.13. Photo by author. 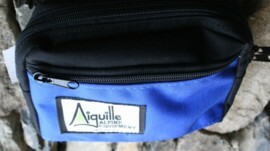 Aiguille Alpine hip belt pouch. Made in England. 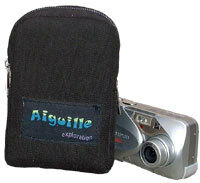 Aiguille Alpine camera case. Made in England. The label on the outside reads “Aiguille Exploration”. An Aiguille Alpine Runout Rucksack in Olive Green. Made in England. Purchased August 2013 and still going strong. Photograph by author. The Hawthorn Original rucksack. Made in London. 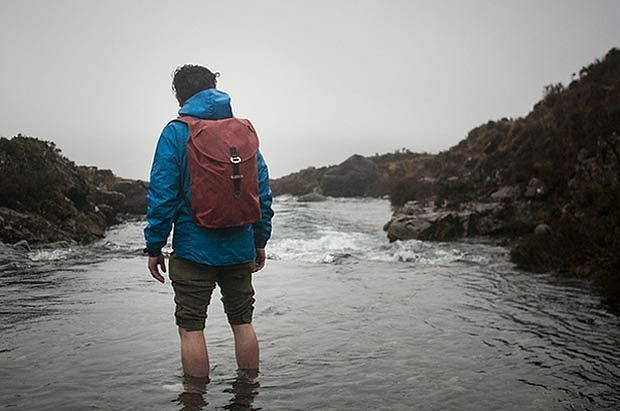 Karrimor used to manufacture moderately priced quality backpacks in England (until the mid-1990s when they went bankrupt and the name was subsequently purchased by Sports Direct) but these all Karrimor products made abroad. 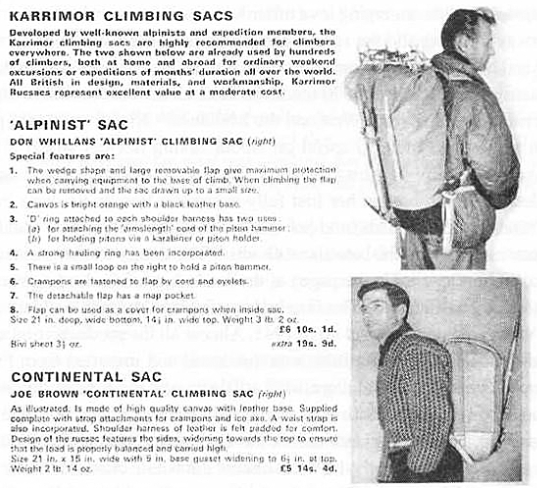 Karrimor rucksack advert circa 1960s. What Daisy Did is a new Kickstarter project (as of August 2016) hoping to make bags using recycled materials in the UK. Their Wayfarer Collection uses water-restistent ex-military materials, mostly canvas tents that have missing parts, together with other materials around 95% of which are re-cycled and which are sourced locally with some raw materials being made in the UK possibly. Their zips come from the last remaining zip factory in the UK, Zipex. They have teamed up with with the Northampton Hope Centre, a homeless charity and are piloting a scheme to offer employment to vulnerable and homeless people and give some of their profits to this charity. The bags this company currently sell are all foreign made and it is only their Wayfarer collection of bags that will be made in the UK. Their Kickstarter campaign has already raised the £12,000 they wanted and finished at the end of August 2016. Please see the video below. Alpkit.com now sell UK made kitbags. Alpkit do great outdoor kit, but most of their stuff is made abroad. 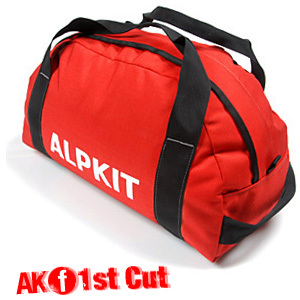 Alpkit now sell UK made bouldering mats, UK made socks, a UK made figfour dry tool, a 9 litre stash bag. 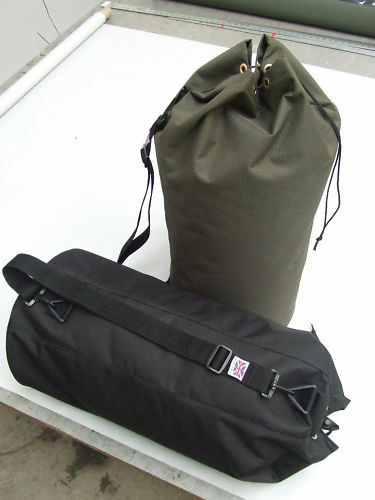 a UK made climbing rucksack, some UK made instant freeze-dried foods and UK made kitbags like that in the picture below (made with UK and German origin fabric and YKK zips). Quite a bit of their bike luggage is now made in the UK too, including frame bags, handlebar harnesses, handlebar pouches, top tube pouches, a saddle bag and handlebar mounted water bottle pouches. Based on the edge of the Peak District, Alpkit have their own small factory making duffles, packs and bike packing bags and are selling increasingly more UK made products. 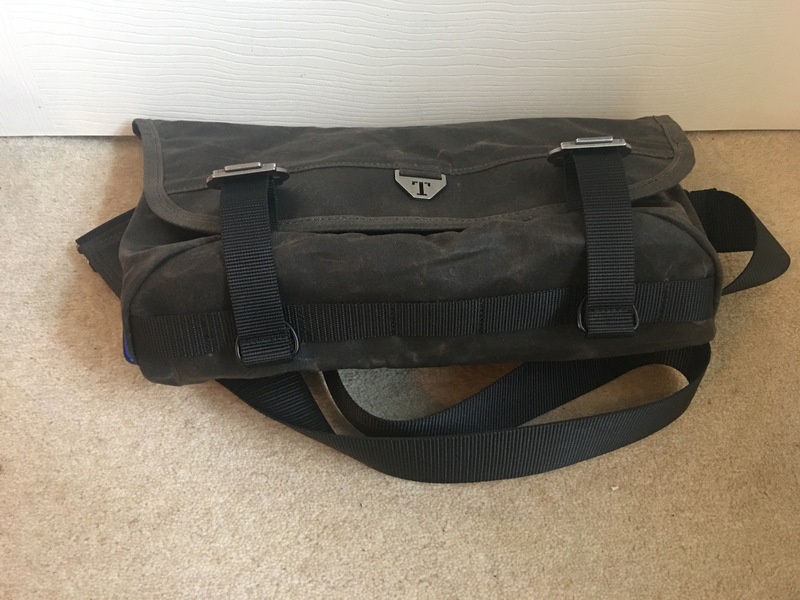 Alpkit KitBag [Small] 30L duffle bag. Made in the UK (using UK nylon, German Cordura and YKK zips). Screenshot from the above video. 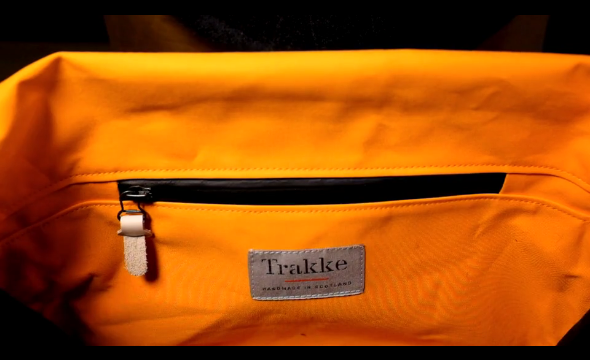 Trakke Bairn Mk2 messenger bag. Label detail. Made in Scotland. Made from British made waxed cotton. The bright orange inside makes it easier to find things in the bag. Trakke Bairn Mk2 in Olive. Made in Scotland. Photographed by author 28 November 2017. Trakke Bairn Mk2 in Olive. Made in Scotland. Photograph by author 25 December 2017. My everyday use current Marimekko shoulder bag weighs around 580g whereas this bag weighs around 675g but then this is a substantial bit of kit and still not really heavy. The Marimekko bag is deeper but this bag is wider. My Marimekko bag was made in Finland whereas these days Marimekko products are made in Estonia. Anyway, the Adventure Begins! A new everyday bag is a start! 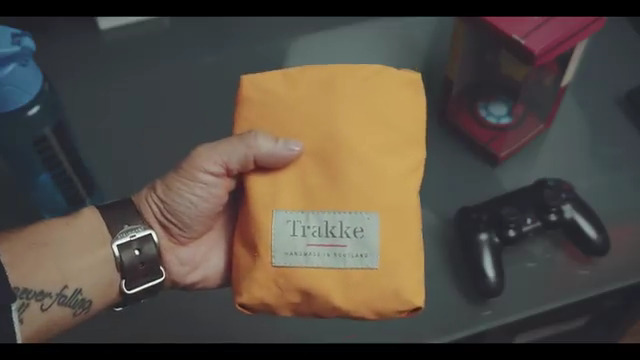 Trakke Foulden Small pouch / packing cube. Label view. Made in Scotland. Screen shot from the EDC video below. Cherchbi tweed and leather bags and accessories are entirely designed and made in Britain. Some of their luxury range of bags uses wool from Herdwick sheep. They make holdalls, rucksacks, shoulder bags, etc. 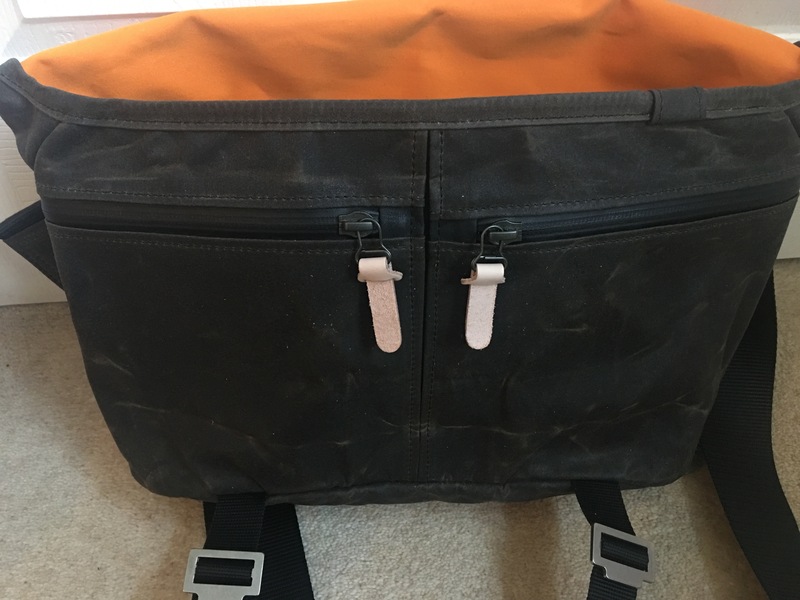 The Dartmouth Canvas Factory make a wide variety of canvas products including duffel bags, cruising (or weekend or airline carry on) bags, and so on, as well as garden awnings. Made in Devon, England. They also stock some foreign made items, such as Tilley hats which are mostly made in Canada. BIGxTOP (or Big Top) make rucksacks (daysacks), a messenger bag, accessory pouches, phone pouches, hip pouches, pedal foot straps, and saddle rolls. Designed and made with cycling and the outdoors in mind, all BigxTop bags are made in the UK. There’s a review of the Bigxtop daysacks here. 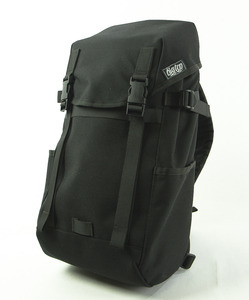 BigxTop Daysack (black). Made in the UK. 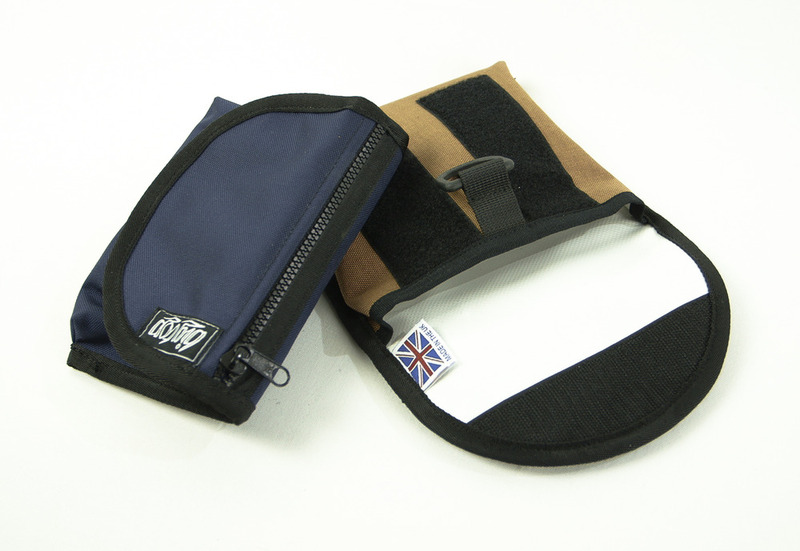 Compact Hip Pouch 17x12x2cm made in the UK by BIGxTOP. 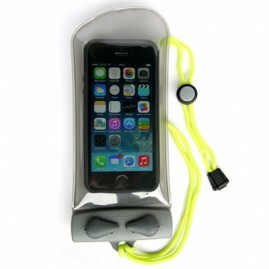 BigxTop Accessory Pouch. Made in the UK. Ace Cafe have a few British made leather belt pouches for sale. Sadly Draw Rucksacks from Wales are no longer being made. Swaine Adeney Brigg make exclusive traditionally styled suitcases and luggage, as well as holdalls, briefcases, document cases and folios. All made in the UK as far as I know. They also make an exclusive bespoke trunk, presumably in the UK. Swaine Adeney Brigg also own own Papworth Travel Goods who manufacture in the UK as far as I am aware and make attaché cases, document cases, folios, computer bags, bar cases and briefcases. Black House sell made in the UK own label tweed holdalls, man bags, and ladies handbags. 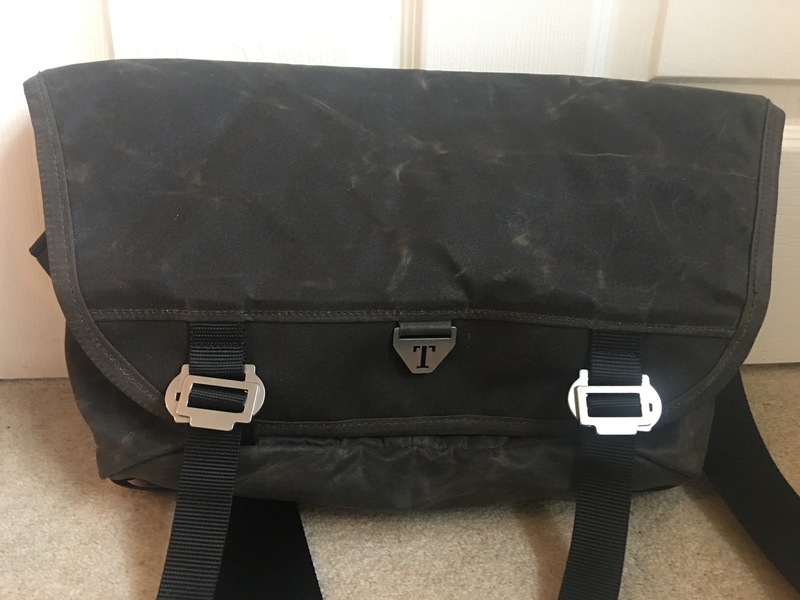 Tusting – made in England holdall type luggage, travel bags, briefcases, satchels, handbags, totes, shoulder bags, wallets, purses, wash bags, briefcases, satchels, handbags, folios, clutches, tech cases, and so on. Ettinger make and sell luxury made in England holdalls, wallets, purses, technology cases, luggage tags, travel wallets, and more. The Belmont by Abel Apparel. 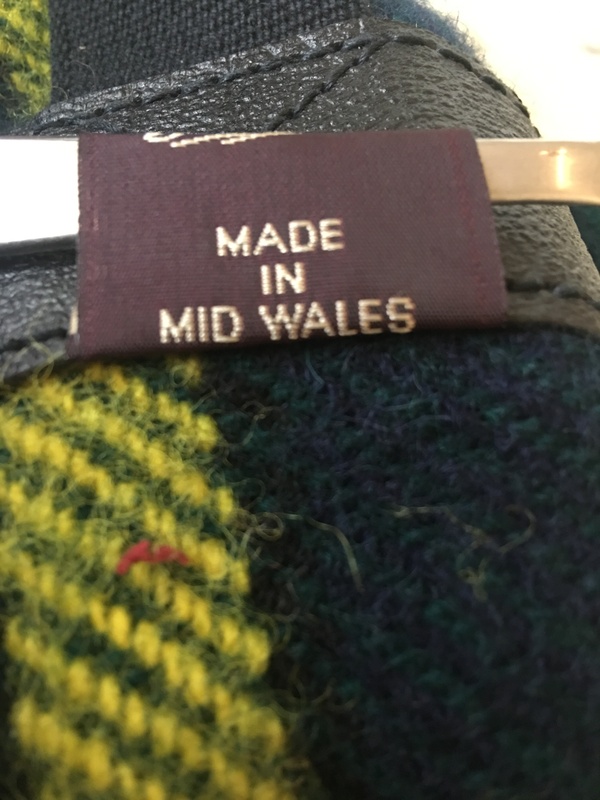 Made in Wales. 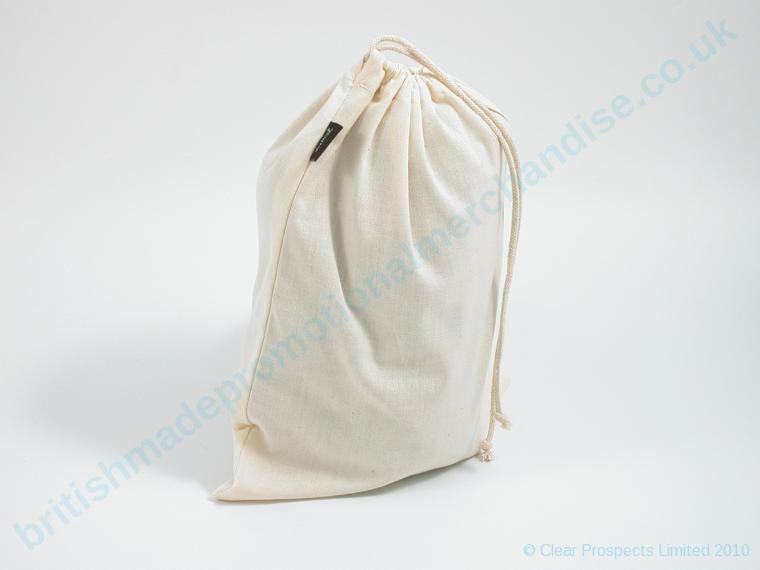 I came across this luxury overnight bag on the internet, from a company called Pedlars. London Undercover sell a range of made in England holdalls. Alfred Dunhill was founded in 1893 and over the years have supplied a variety of luxury goods including motor car accessories such as goggles and clothing, smoking products and accessories like lighters and pipes, menswear, leather goods and accessories. They apparently have their own leather workshop in London and have recently sold British made holdalls and document cases and shoes. In the past most of their items would have been manufactured in the UK. 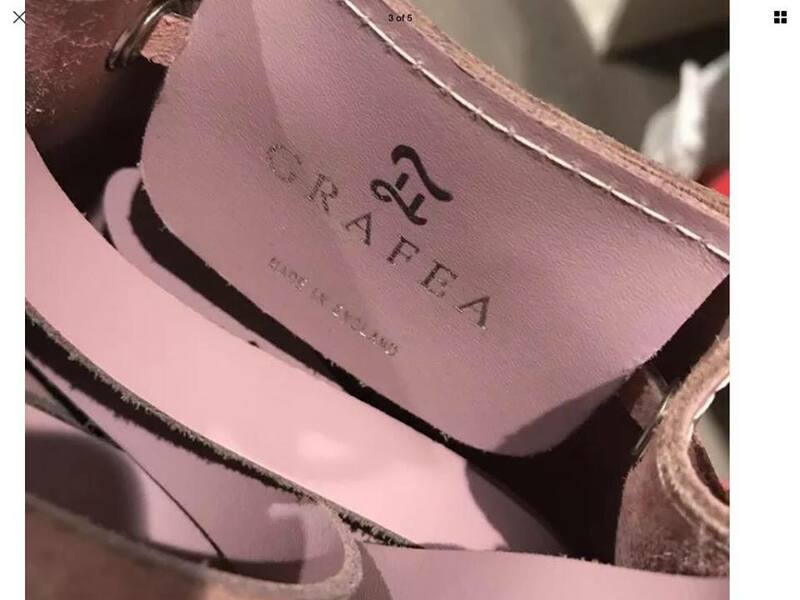 Today they give no country of origin information whatsoever on their website and the vast majority of their bags and other items are foreign made. 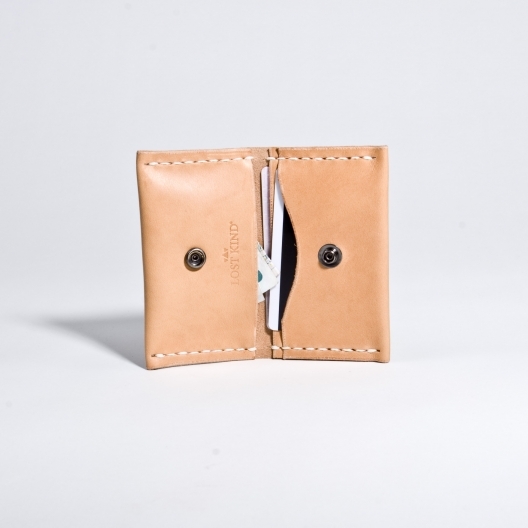 Henry Tomkins leather goods are made in Exeter, England. 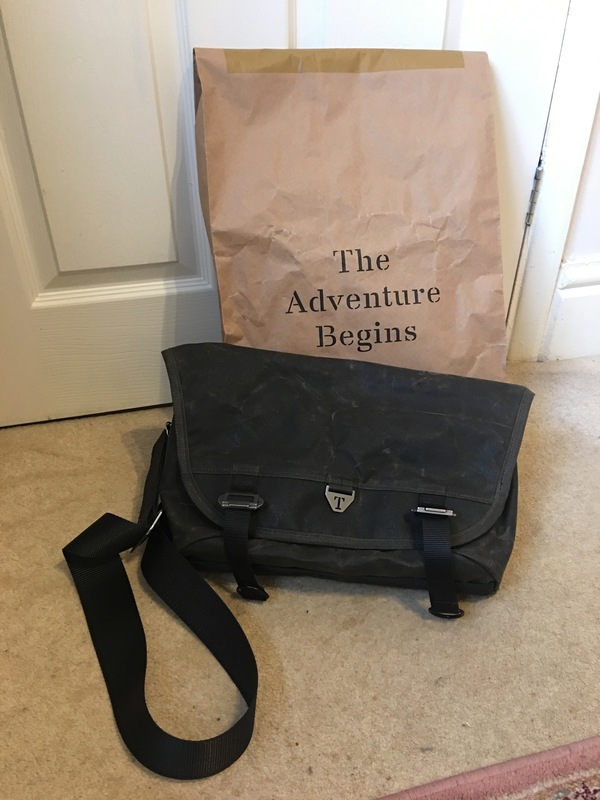 The range includes leather luggage (holdalls), as well as leather handbags, shoulder bags, briefcases, satchels, rucksacks, soft sided bags and custom made bags. 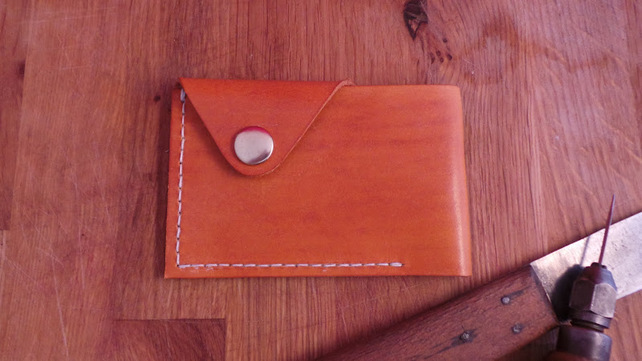 A range of Henry Tomkins’ designs can be seen at Custom Leather in Camden Lock in London, where they also make some of their own leather products on the premises. Umpie sell British made carpet bags and overnight bags, handbags, man bags, as well as mens and ladies belts and scarves. Ray Mears Bushcraft sell a range of made in England small leather goods, including for example a belt pouch and a compass case. 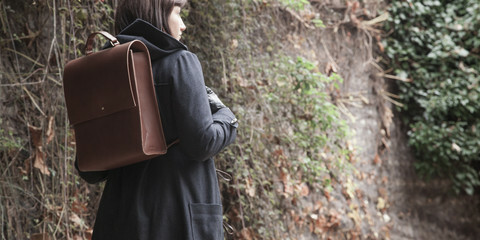 Lost Kind make their products in the UK; leather satchels and small leather goods. Lost Kind Desert Mini Wallet. 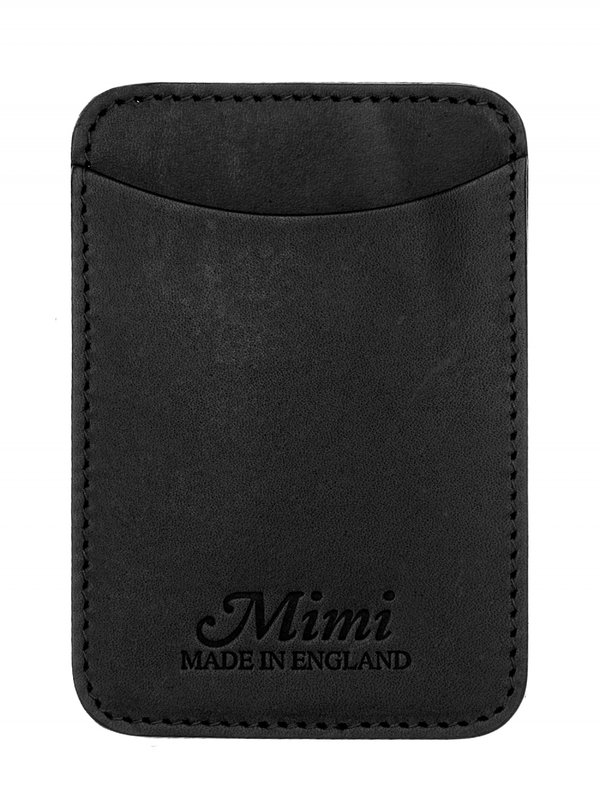 Made in the UK (using Italian leather). Alphabet Bags have some nice made in the UK tote bags and little canvas (pencil case like) pouches. Their other products are foreign made though. PackaPouch is an interesting idea (a kangaroo pouch of sorts for humans) and is designed and manufactured in the United Kingdom. Another interesting idea is the Yoke Shopper (a cheap and simple device to help make carrying shopping bags easier), which is made in Great Britain. 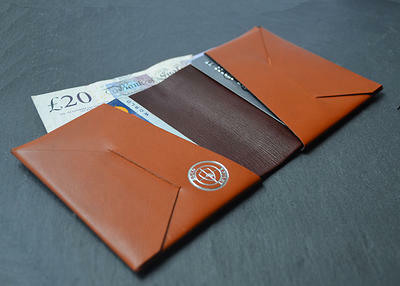 Chester Jefferies make a range of leather accessories in the UK, including for example a small leather coin purse / wallet. The Leather Warehouse at 125-127 Bethnal Green Road (near Liverpool Street Station in London) sell / make in the UK (sometimes on their premises possibly?) 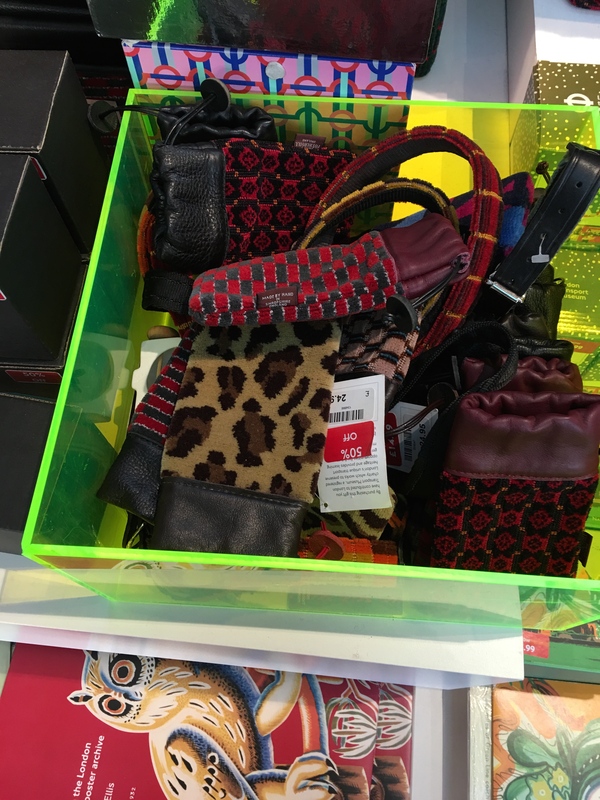 leather goods at reasonable prices such as handbags, small bags, pouches, coin pouches, pencils cases, and the like. They also sell leather jackets, but I am not sure if these are UK made. The website clearly states which items are UK made – http://theleatherwarehouse.co.uk You can sometimes find nice UK made new and used suitcases and travel goods on eBay, such as this brand new small coin purse / wallet pictured below. This coin purse is made by Heritage Leathergoods (see further down). 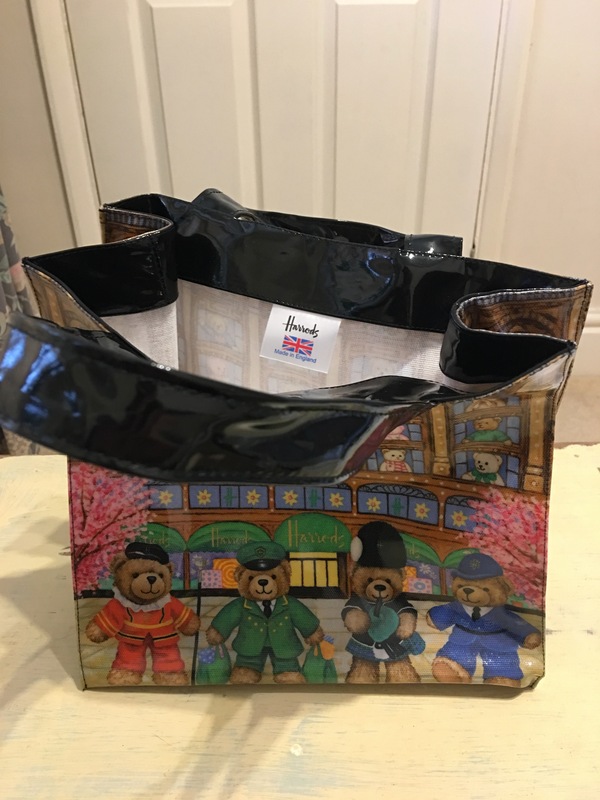 For something a bit different try Luck Ladybird Craft – made in England bags and purses in the shape of cakes and the like – Swiss Roll bags, Sushi bags, cupcake bags, battenberg, etc. An Amy Britton made in Scotland pouch on display at the gift shop in Inverness Airport. Photograph by author. Intelligent Armour own brand tactical kit is made in the UK and they do a range of pouches, travel cases and so on in camouflage material, some using the MOLLE system. British Tactical tactical kit is made in the UK and they do a range of pouches, travel cases and so on in camouflage material and other colours, some using the MOLLE system. All their gear is made in the UK. G1098 Supplies have a few bits of tactical kit that are made in the UK, such as MOLLE system pouches in camouflage material. 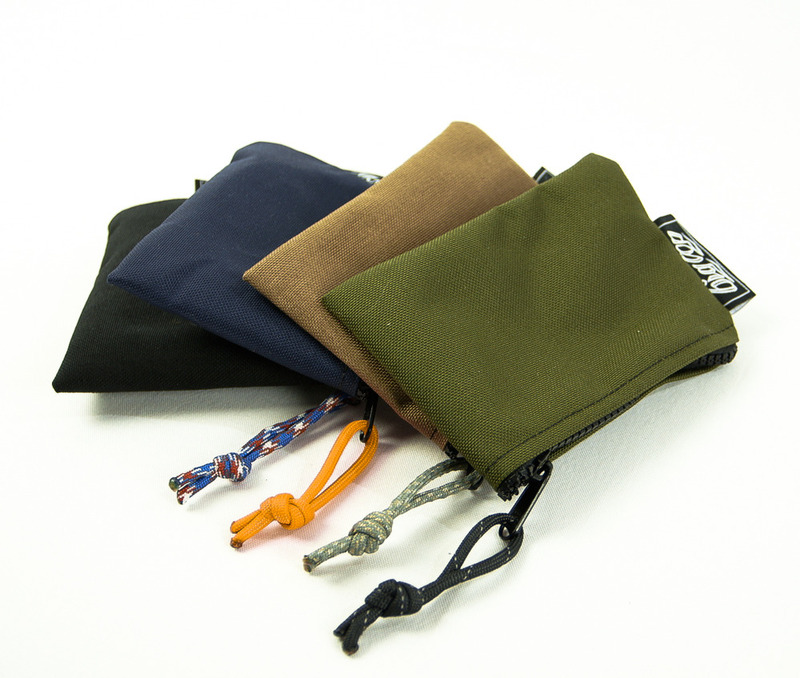 Jed Phoenix sell a UK made utility pocket / sporran pocket, a utility bag and a belt pouch, amongst other things. 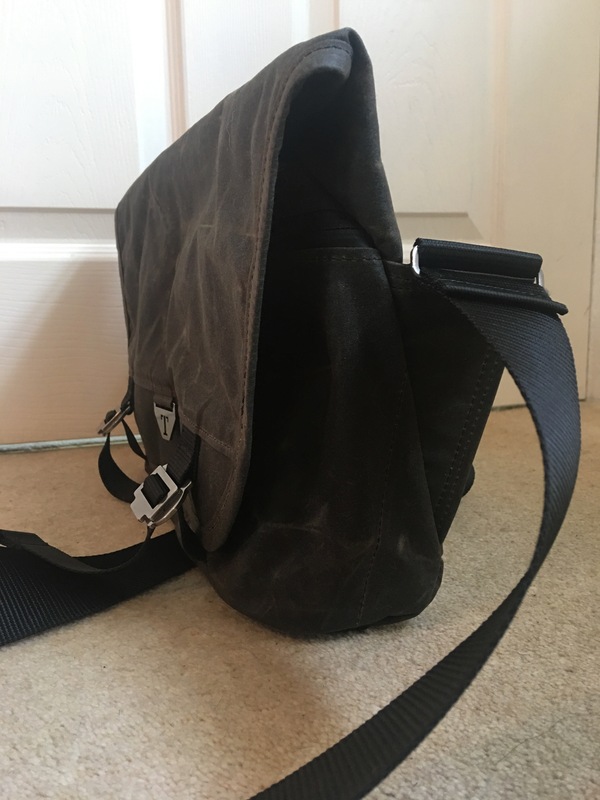 Journeyman Leather make a small range of bags, as well as saddlery and dog collars and leads in the UK. 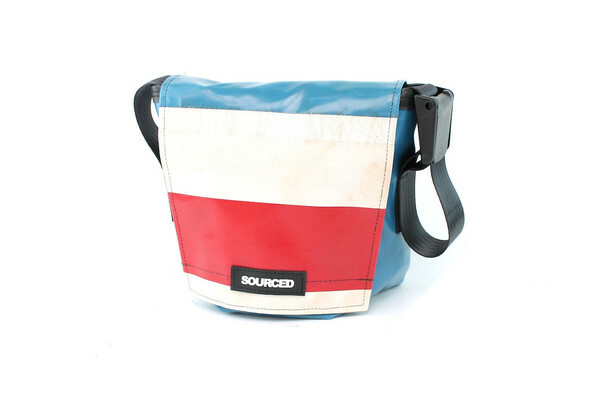 useuk handbags are made in England and some of the larger ones might be suitable for a weekend away. 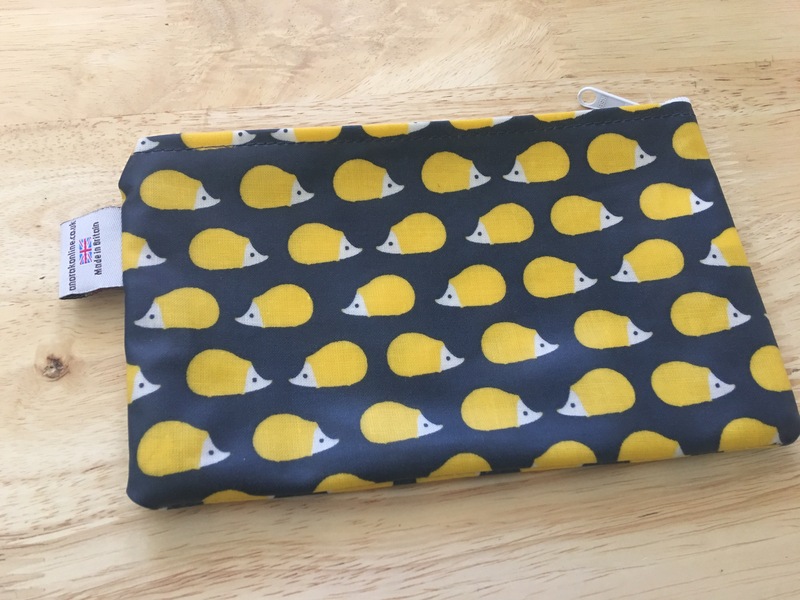 Jen Made This make purses, tote bags and make-up pouches in the UK, as well as aprons, carrier bag dispensers, etc. nononthehighstreet have some British made bags and purses – look for the words made in Britain or filter to find made in Britain. Steven Harkin leather handbags are made in England by Steven, albeit from Italian or Spanish leather. They are for sale online or in a shop called anecdotes design in Kent, who might also sell a few other British made items – http://www.anecdotesdesign.com IT Luggage (Landor & Hawa) suitcases, including their “World’s Lightest” range, are all made in China (as they have been since the company started up). As far as I know Carlton have moved all their production abroad. Antler have confirmed to me that they no longer manufacture within the UK and that all production takes place in the Far East. 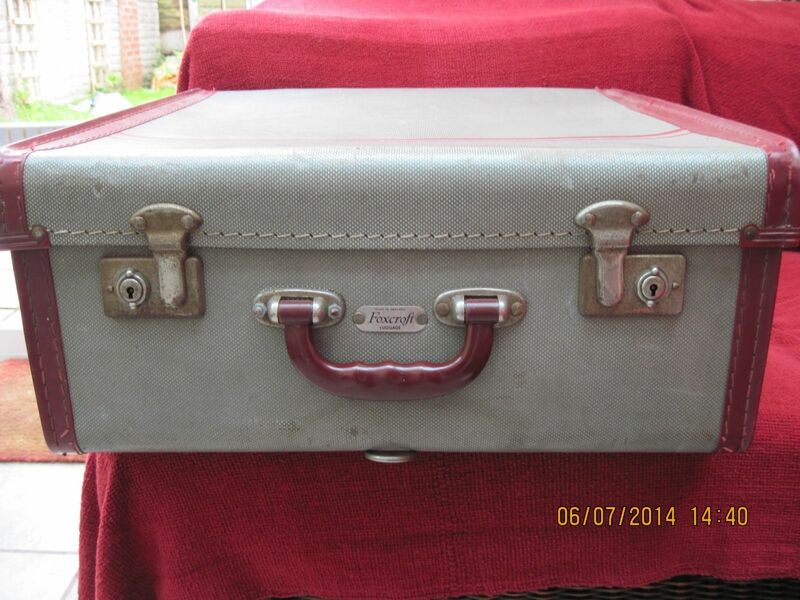 Vintage Foxcroft Suitcase made in England, Foxcroft were later taken over by Antler who now only manufacture abroad. 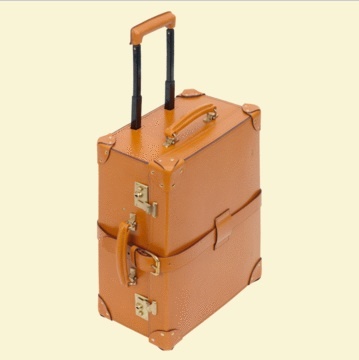 Globe-Trotter luggage, established in 1897, make luxury traditionally styles suitcases. Hand made by Globe-Trotter in Broxbourne, Hertfordshire using original manufacturing methods. Each case is uniquely constructed from vulcanised fibreboard; a special material invented in Britain during the 1850’s consisting of multiple layers of bonded paper. Handles are produced by the leather team who also form the iconic Globe-Trotter corners. Available online, at their store in the Burlington Arcade and in other stores. http://www.globetrotter1897.com These are some photographs of Globe Trotter luggage being made on makeitbritish. A Globe-Trotter Original Green / Tan suitcase. Made in England. 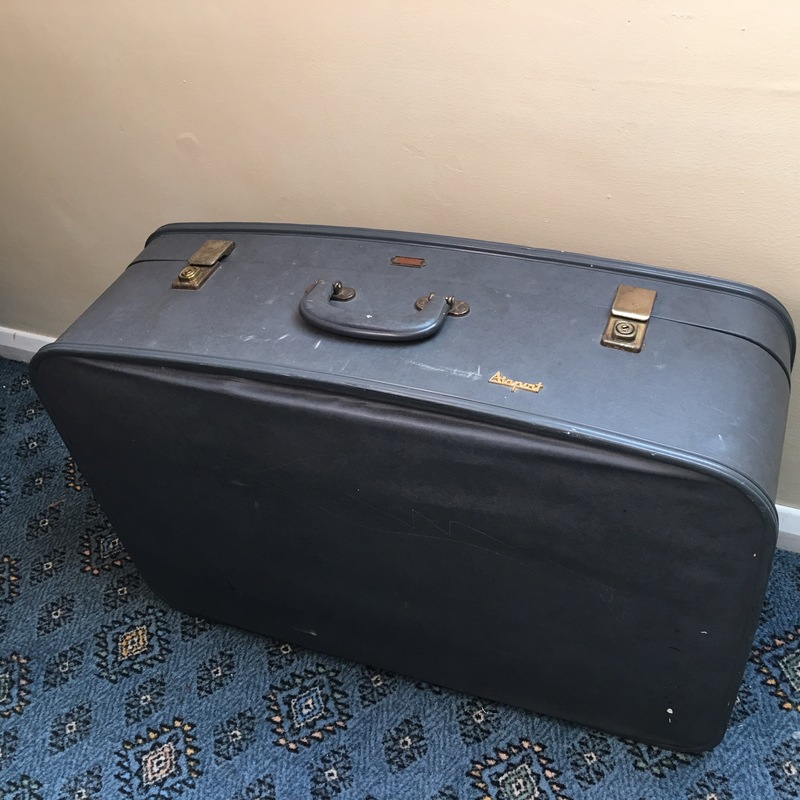 I cannot find any basic standard design modern styled (read cheaper) suitcases that are still made in the UK. Do you know of any please? 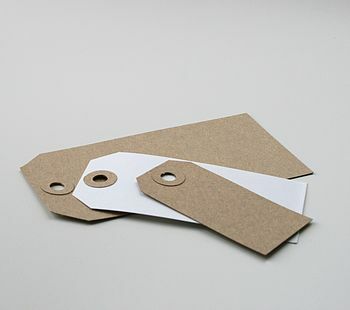 Tusting – leather luggage labels. Ray Mears – leather luggage label. Paper Baker do some manilla buff luggage tags, more for weddings than luggage though. by JANE MEANS. Made in Britain. Also, notonthehighstreet have some card luggage tags that come with bakers twine by Ruby Rhino. And, notonthehighstreet have a leather luggage tag decorated with hummingbirds by Tovicorrie. 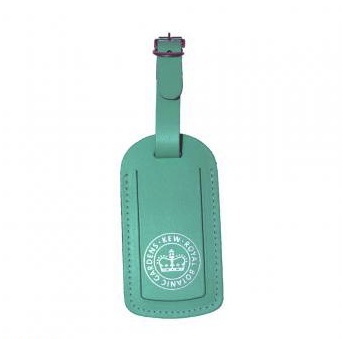 I’m struggling to find many old fashioned buff manila card luggage tags that are made in the UK – any ideas? Kew Gardens sell some very nice and excellent value made in the UK leather luggage tags* (made for them by Under Cover) They also sell a very nice UK made leather travel pass holder. Kew Leather Luggage Tag. Made in the UK. Anthony and Brown leather luggage labels. Made in England. 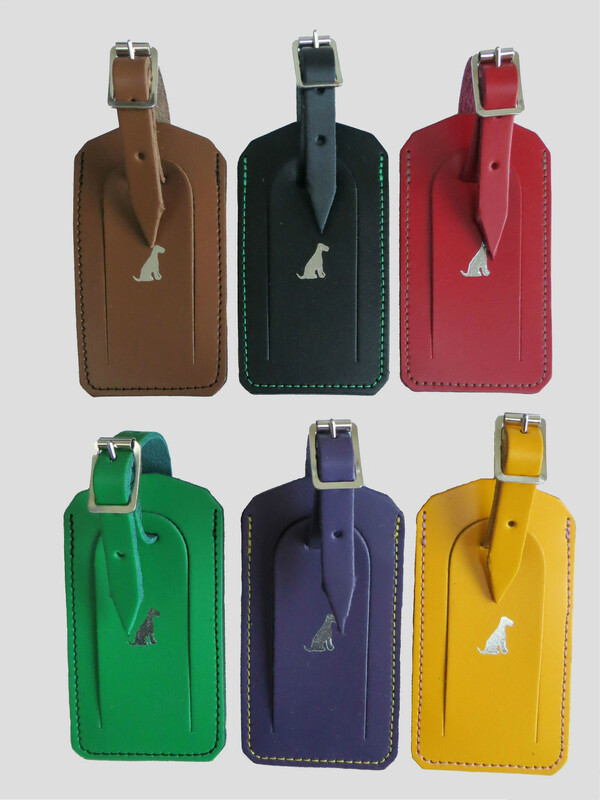 Merchant Fox have a British made leather luggage tag (no cover means your details will be visible). CRUISE E-TICKETS HOLDERS – made in the UK. Made from clear vinyl, reinforced metal eyelet, 150mm vinyl loop. On eBay. 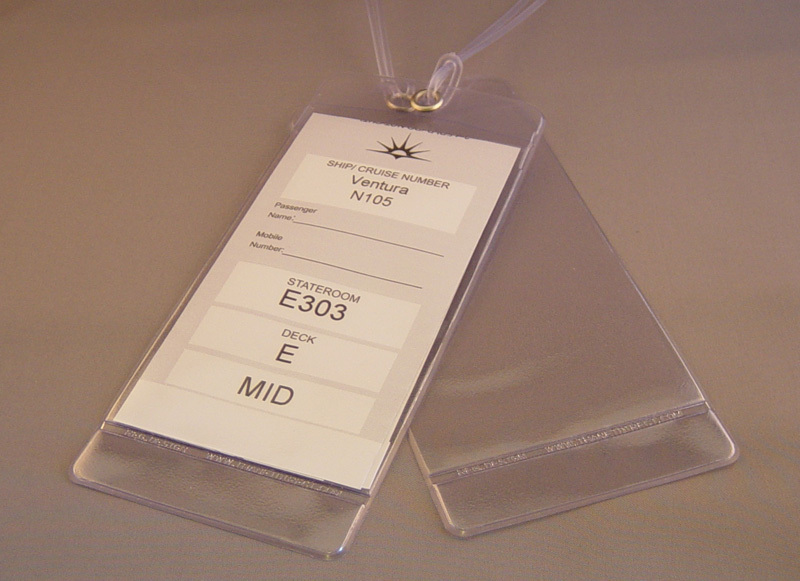 Thanet Direct Standard Luggage E-tag holder (cruise lugage tag). Made in England. Monocle sell some leather luggage tags by Ettinger. 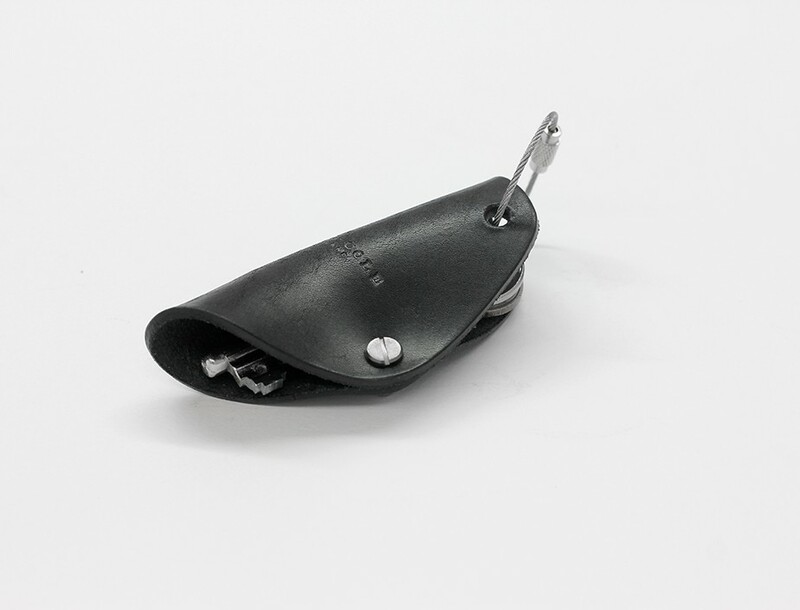 Ettinger themselves make and sell UK made leather luggage tags. This company sell UK made Bakers Twine in bright colours. I found these British made see-through plastic passport covers on e-bay. I use these and they are very good. 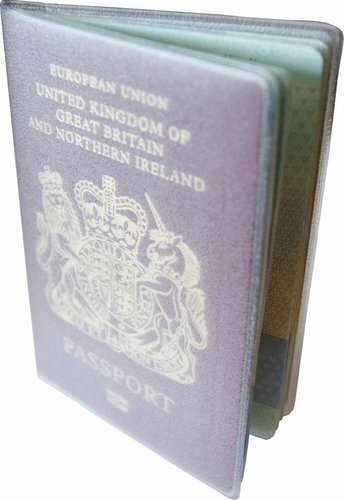 They are made in the UK by KLAYZER Stationary Limited – http://www.passportjacket.com – They also make driving licence holders in see-through plastic. 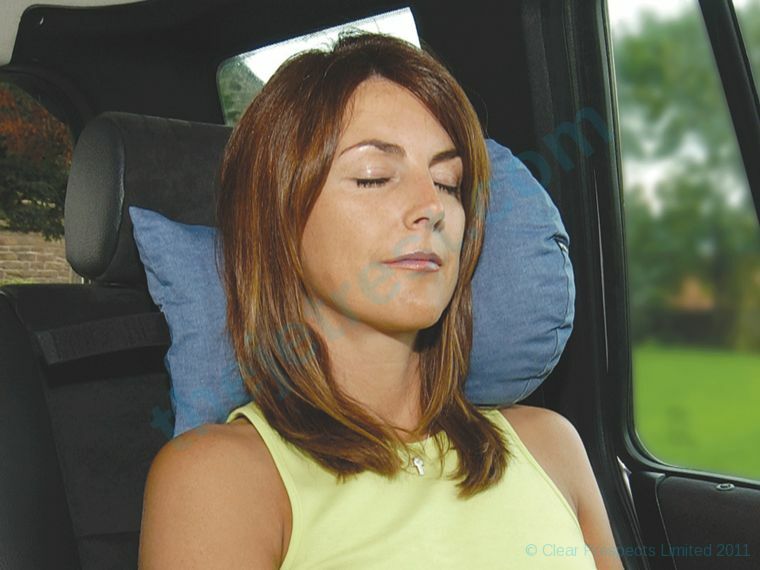 The JetRest Original Travel Pillow. British Made. 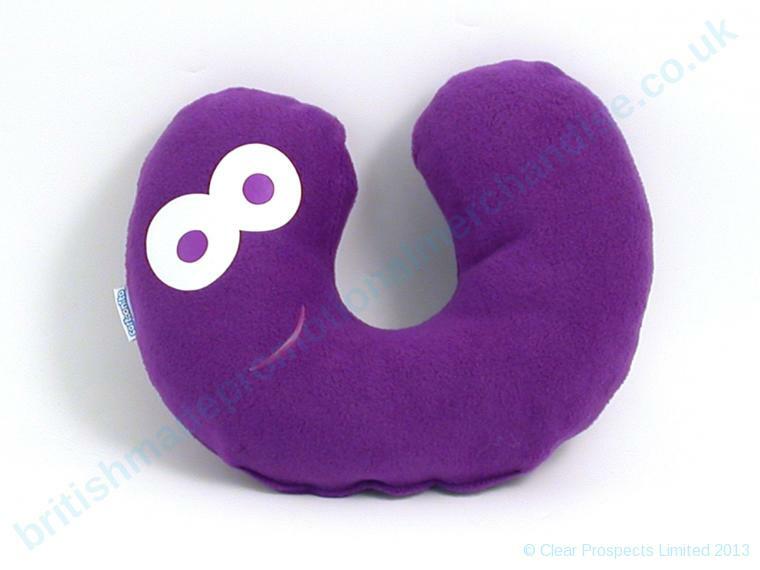 U-Shaped Travel Pillow made in purple fleece for promotional merchandise. Also available unbranded to the public. By British Made Promotional Merchandise. Made in the UK. 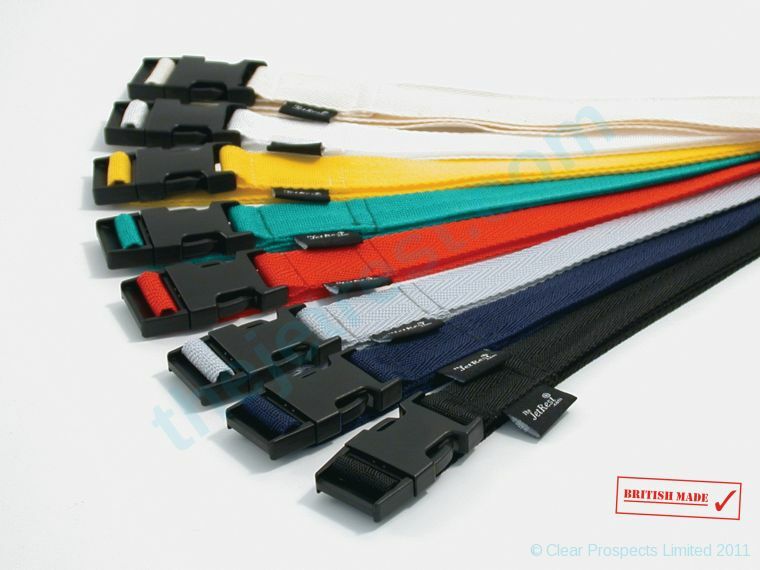 British made luggage straps from The Jet Rest. 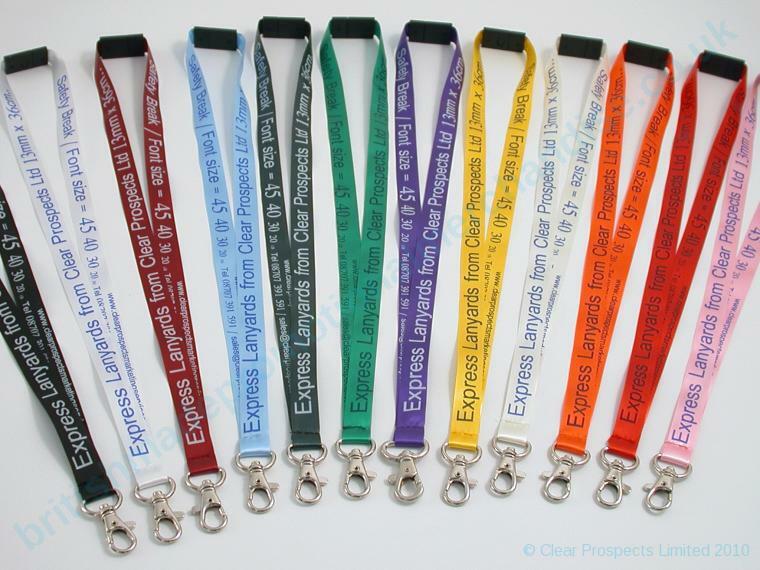 Clear Prospects British made lanyards. Various colours. Pure silk. Optional safety break. 90cm standard length but other lengths possible. Plain or with writing. In quanity or individually available. Putnam LUX Memory Foam Travel Pillow; inflatable with an additional layer of memory foam built in. British made. For heavy duty compression straps, Wetkama on eBay have a good choice. 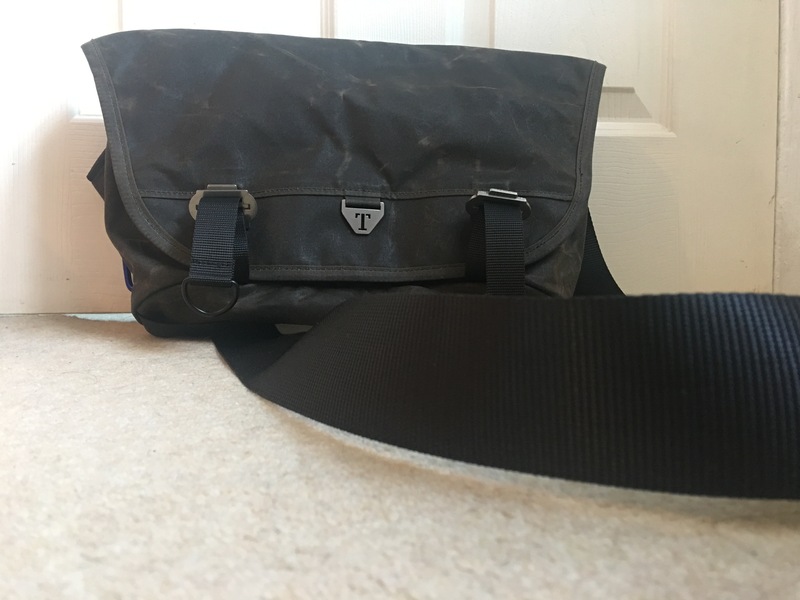 I have found it hard to find any British made bungee straps (bungee cords / elastic luggage straps), but possibly Regray Textiles Ltd make them? Not sure where you can buy these, so you’ll have to contact the company direct and to check if these bungee straps are British made. Regray luggage straps. Made in the UK? 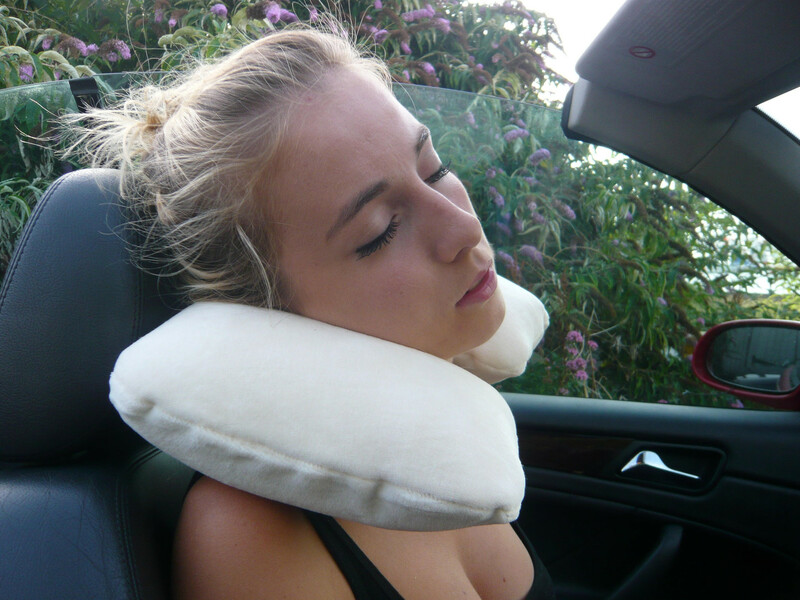 Creating Comfort make in the UK a memory foam travel pillow for car travel with a velcro seatbelt attachment. 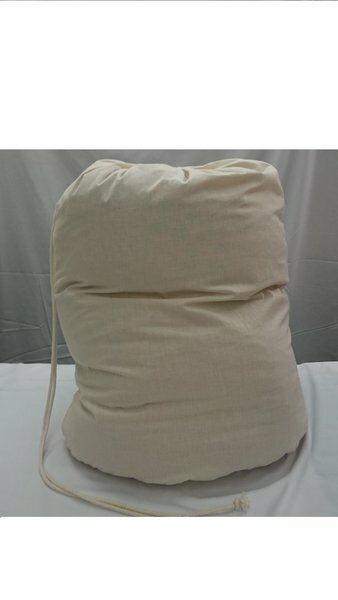 This company no longer make their horseshoe shaped travel pillow. 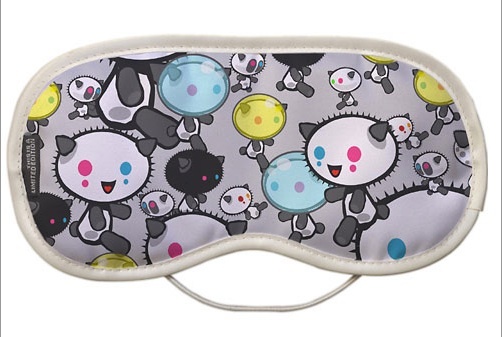 I found some fabulous looking made in England eye masks to help you sleep even in a bright light on a website called ClickforArt (a few pictures below). 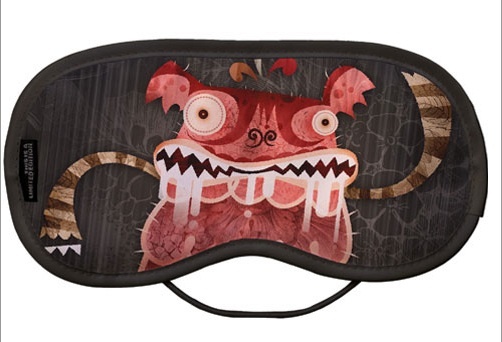 According to their website all ClickforArt products are made in England, not just the eye masks so the whole site is well worth a look around. Fidelitas London Ltd sell UK made Oyster Card holders at http://www.happyoyster.co.uk and on eBay. 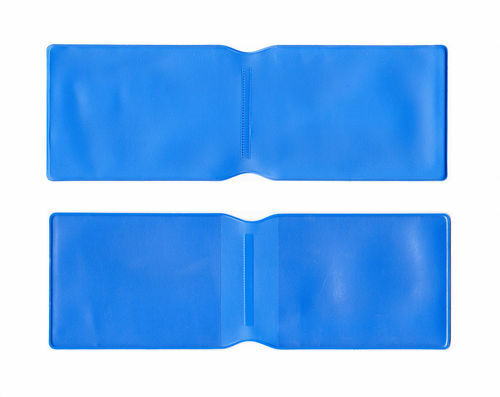 Very reasonably priced and available in a range of colours, these Oyster Card holders / wallets also make a good small lightweight durable travel or general card and cash wallet. Each section measures 2.7″ x 3.5″ (6.8 cm x 8.8 cm). Happy Oyster Light blue Oyster Card Holder. Made in the UK. Also selling British made Oyster Card (etc.) 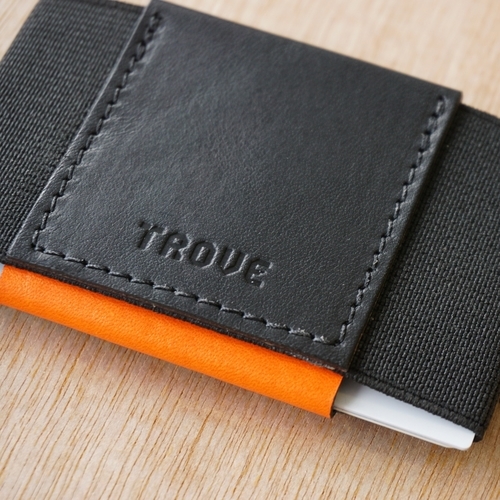 holders is travelwallet.co.uk, trade only and printed with your organisation’s logo. 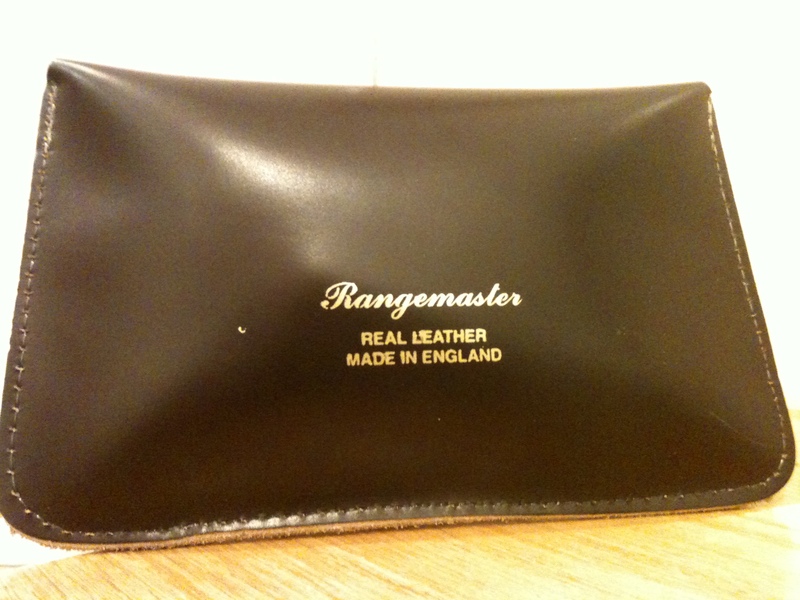 Heritage Leathergoods 100% GENUINE LEATHER Rangemaster Tobacco Pouches. MADE IN ENGLAND. 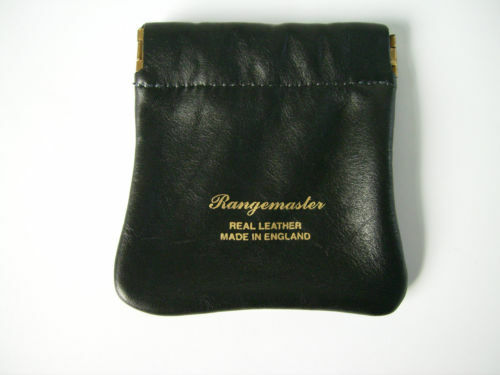 Heritage Leathergoods 100% GENUINE LEATHER Rangemaster Tobacco Pouches. MADE IN ENGLAND. Rear view. Photograph by author. 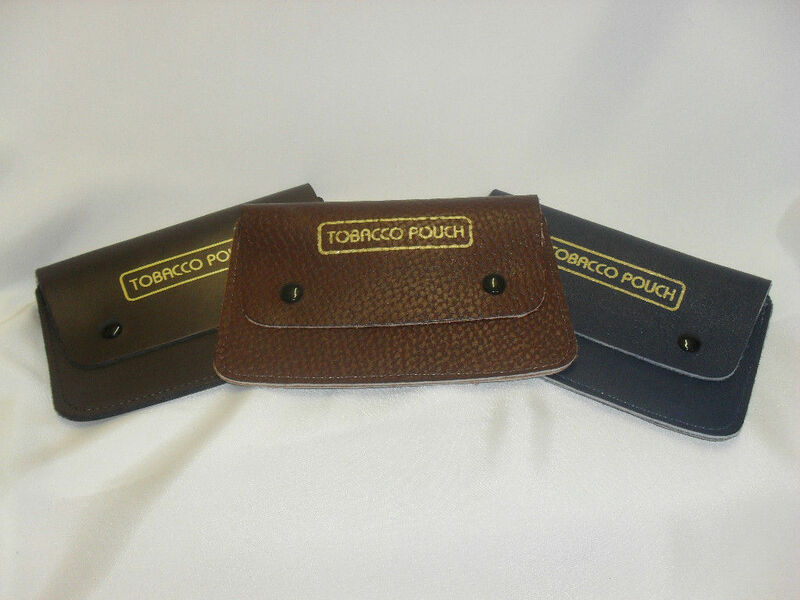 This is a really top quality and well designed tobacco pouch. 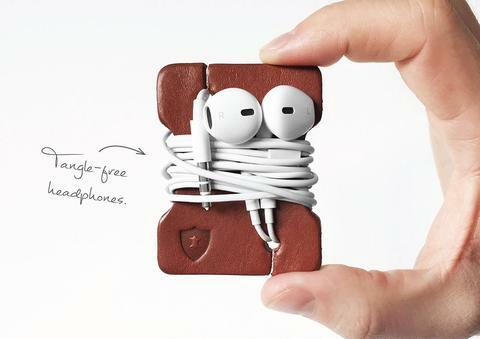 ‘Handmade in England’ leather headphone wraps from Holdall and Co. Printed Caseskinz covers come in a variety of different prints. Photograph from Make it British. 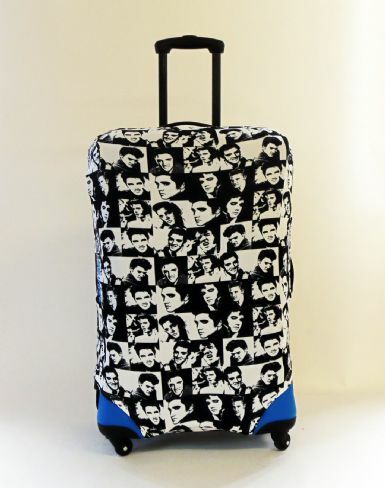 Elvis black and white chequered Caseskinz suitcase cover. Photograph from Make it British. Rose and Rebellion – Baby carriers and bibs made in the UK. http://www.kari-me.com – UK made fabric baby carriers. 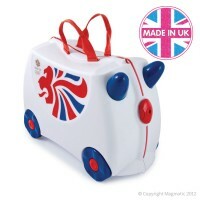 CGR Bike Gear sell Genesis British made bags for prams, to protect them during travel. And for traveling more generally. Can I just say what an amazing resource this blog is. And without personal recognition, unlike other buy British blogs. I have used it many times and therefore several British manufacturers have benefited, albeit in a small way! Keep up the good work. Hi. Thanks for your kind comment. It’s very much appreciated. In a small way too I like to think I am doing something good for British manufacturers and the site helps me to find things for myself too. Brilliant reveiw very comprehensive indeed, Are we featured, We are tagged but couldnt find anything about us, probably just me.. Thank you. Yes, it did turn out to be rather a long article! You are featured. I say “Most handbags and other products from the English Cowhide Company are made in Britain – http://www.englishcowhidecompany.co.uk“. I wonder if this needs amending or expanding because in your introduction on your website you say “everything that you see on this site is carefully crafted in Somerset” I’ve said “most” things are your site are British made. If it is indeed everything, please let me know and I can amend. If you want you can write a short paragraph yourself and I can include that. Cheers.